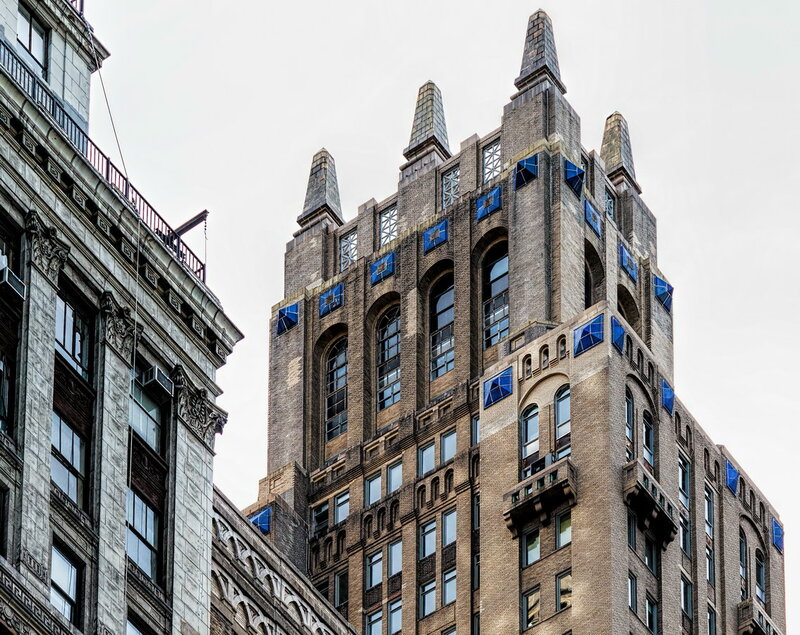 February 22, 2015 Manhattan1915, 80 Lafayette Street, civic center, Hallenbeck-Hungerford Building, lower manhattan, Manhattan, neo-gothic, New York City, residential, William E. Austin. 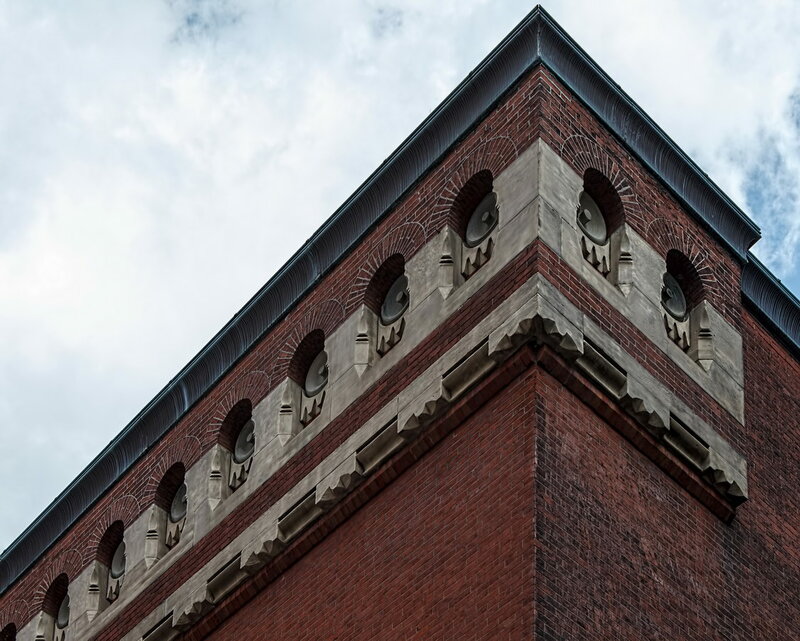 Lafayette Hall (originally Hallenbeck-Hungerford Building) is an attractive neo-Gothic industrial building built to accommodate heavy equipment such as printing presses. 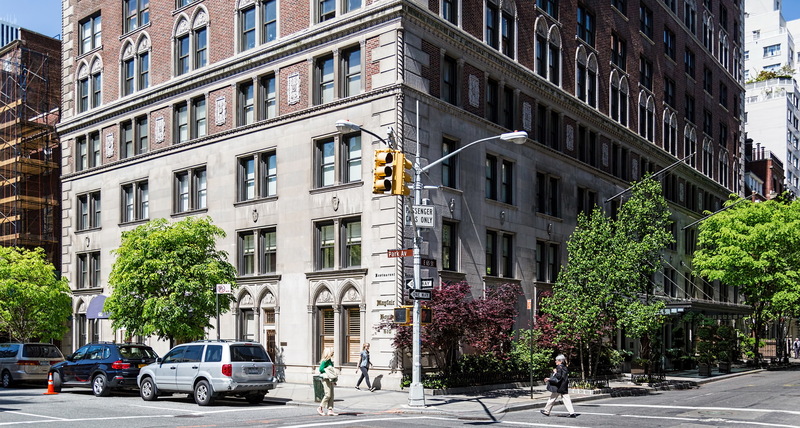 It was converted in 1999 to a residence hall for NYU students. 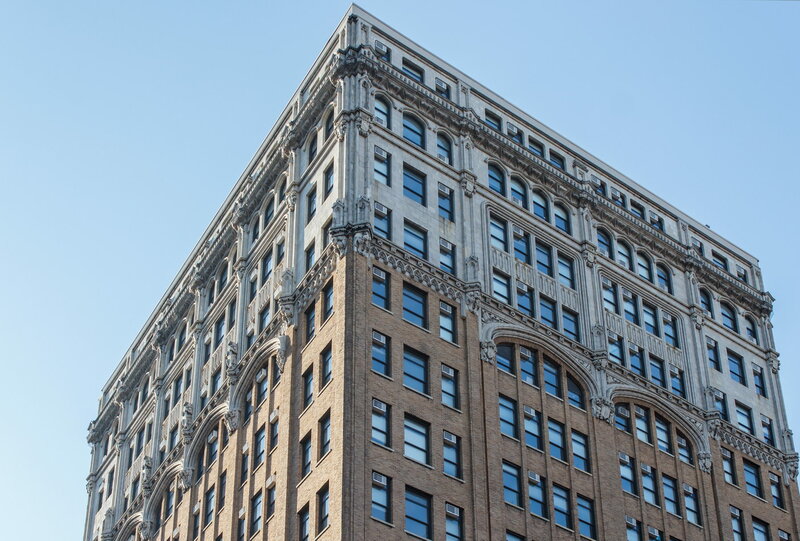 The L-shaped building wraps around the seven-story landmark Ahrens Building. 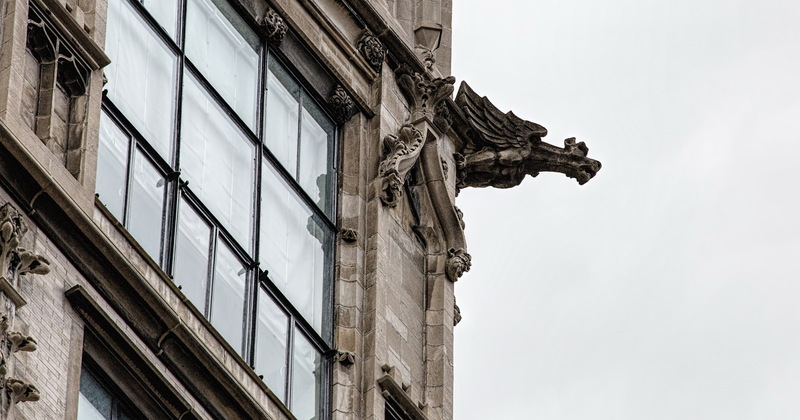 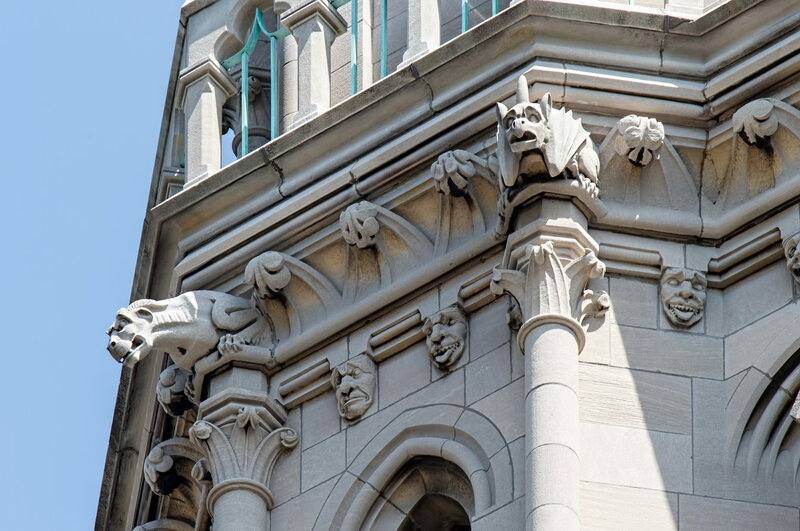 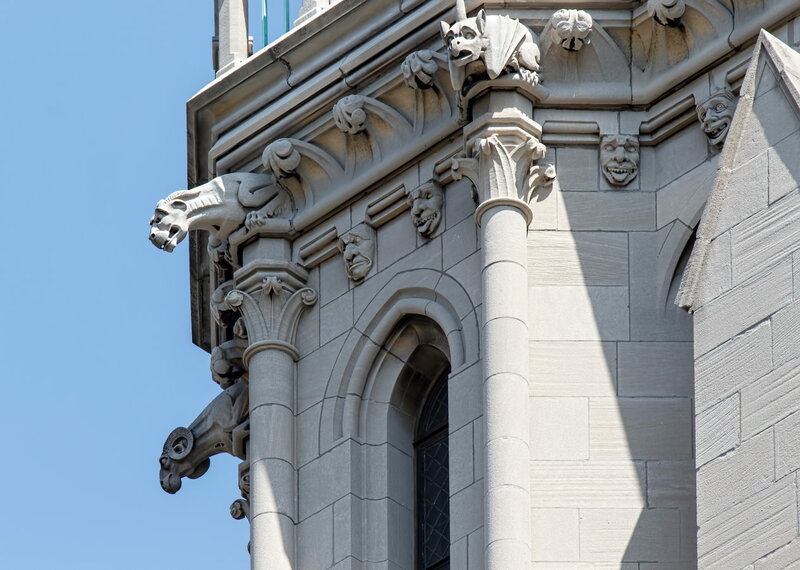 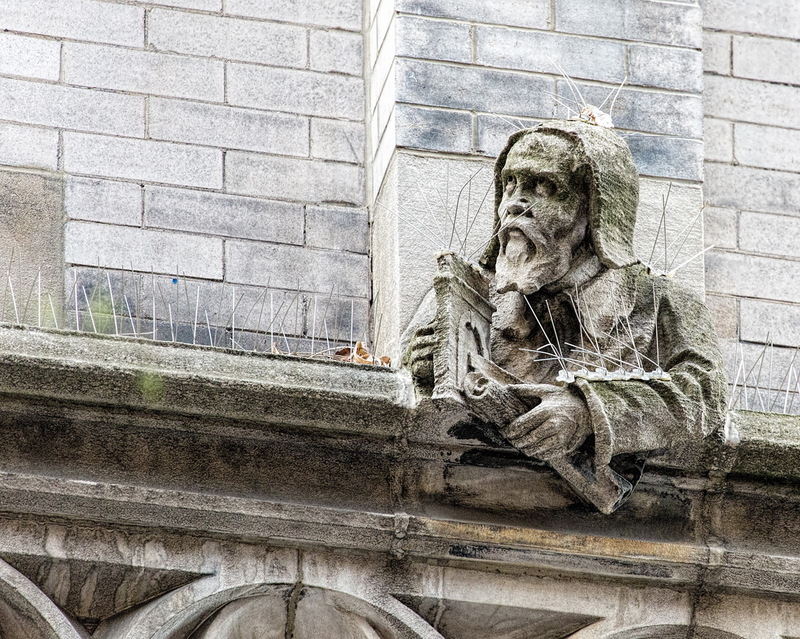 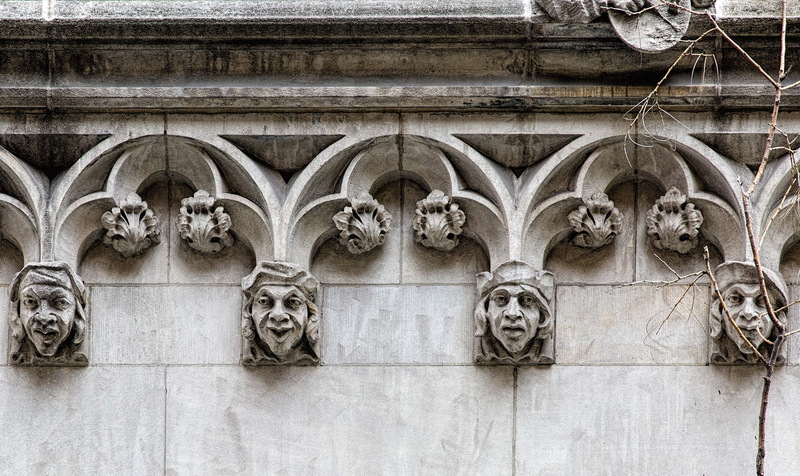 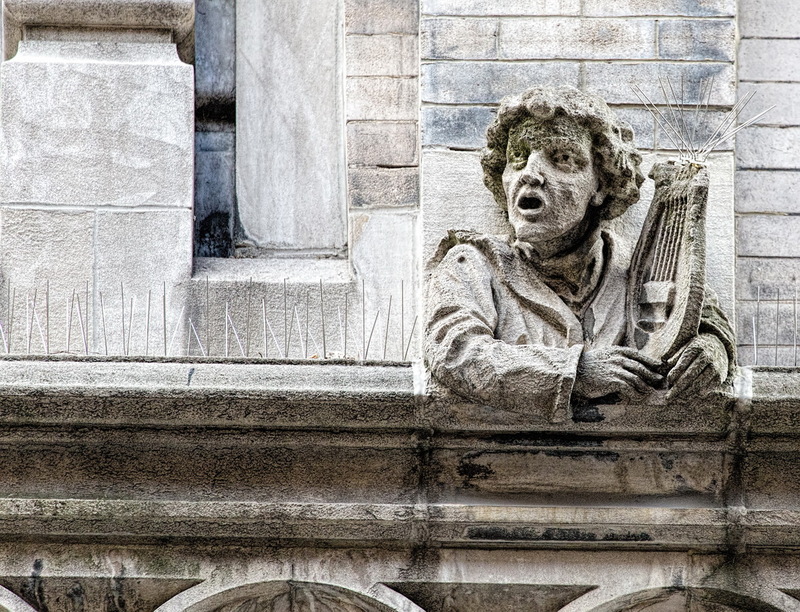 There are interesting grotesques in the upper stories – including headless characters on the 13th floor. 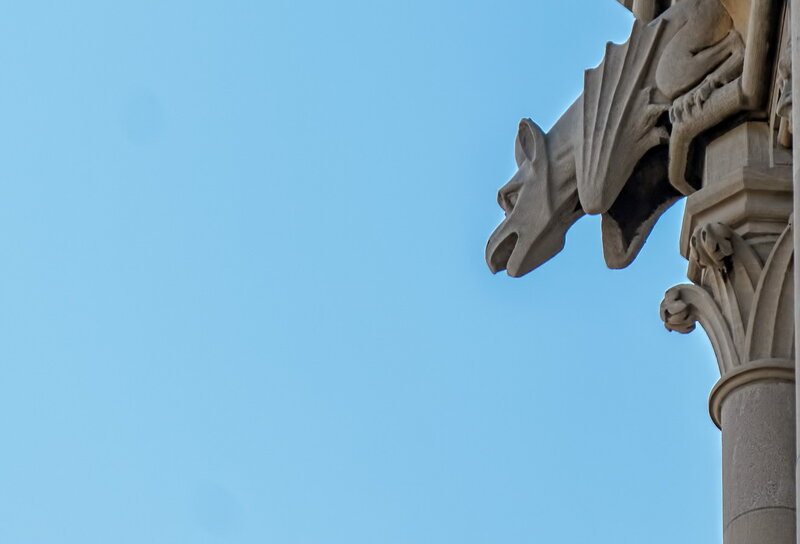 Unlucky for them. 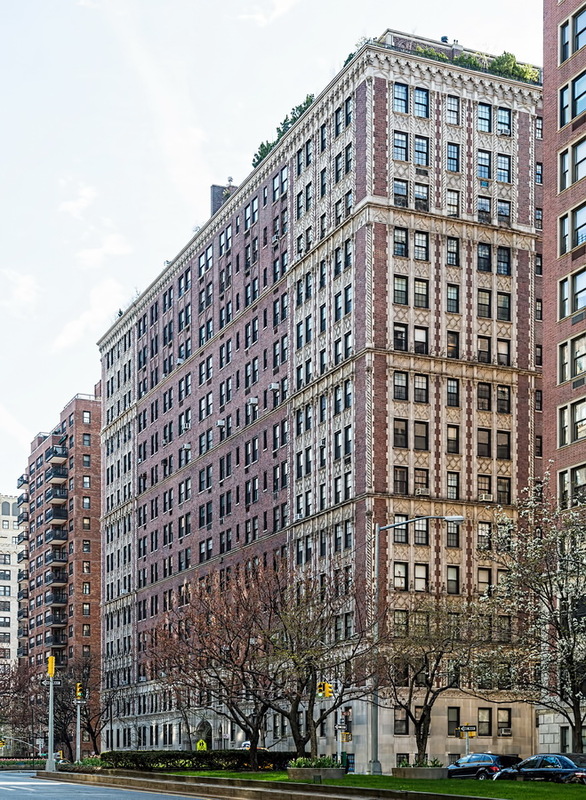 February 22, 2015 Manhattan1909, 44 W 77th Street, apartments, Harde & Short, historic, landmark, luxury, Manhattan, neo-gothic, New York City, residential, upper west side. 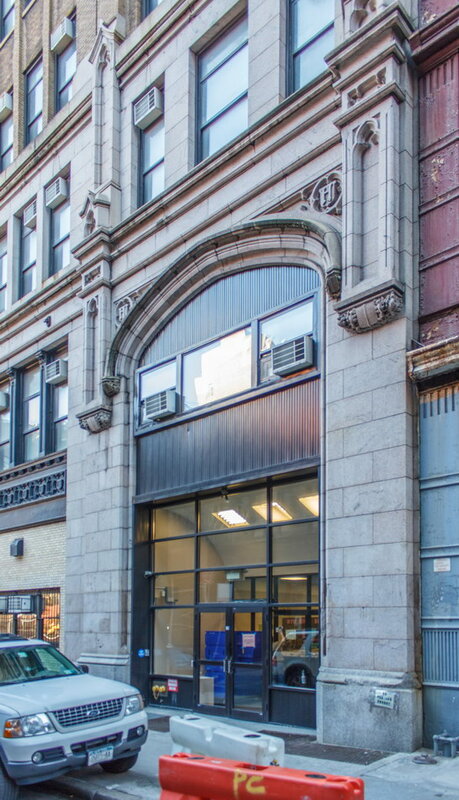 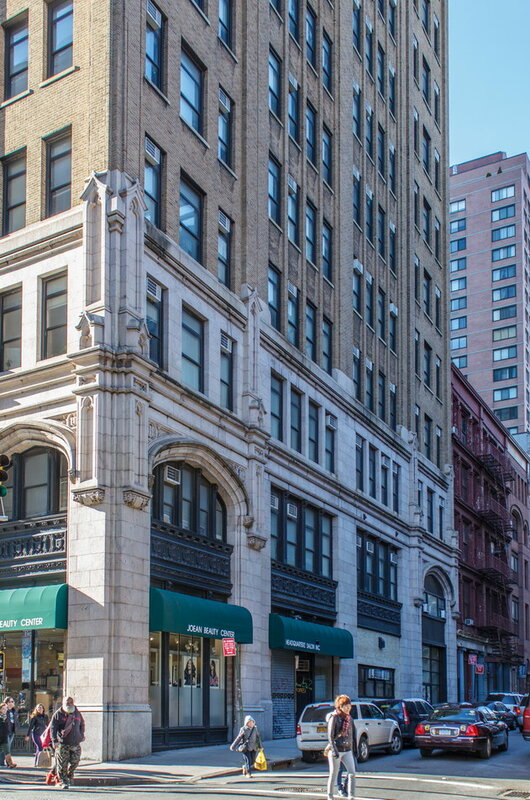 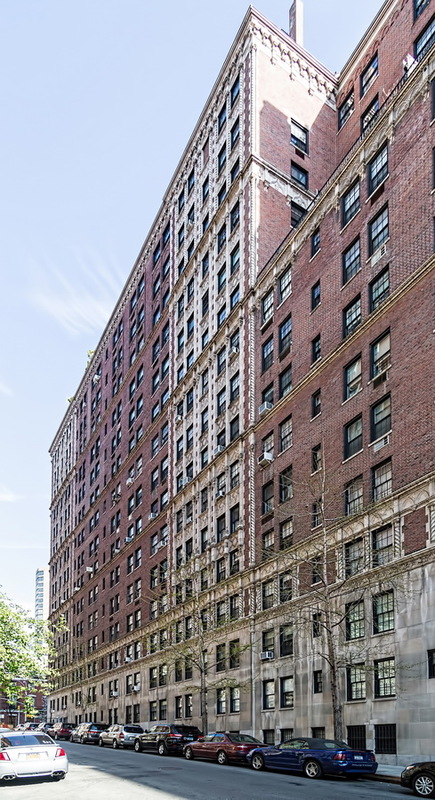 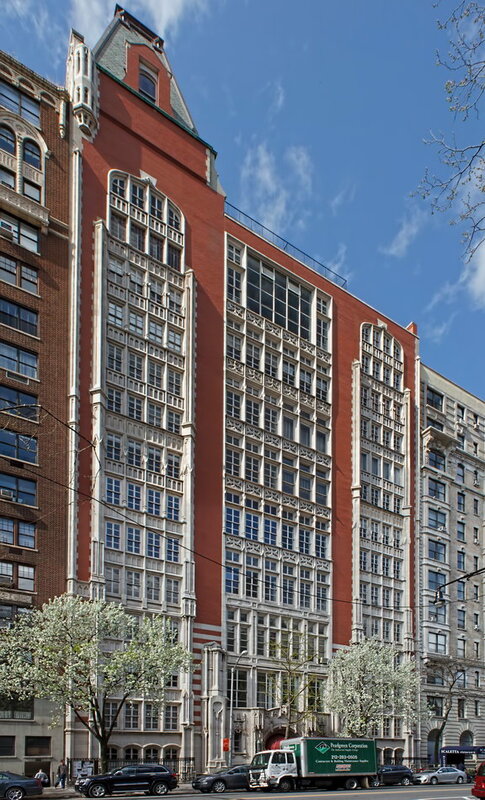 Studio Building aka Studio Apartments (not to be confused with 140 W 57th Street Studio Building – The Beaufort) has just 32 apartments – but what apartments! 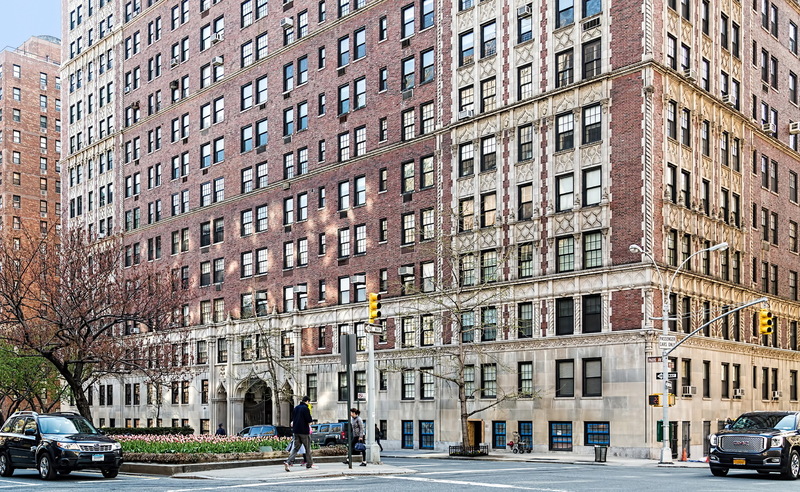 At this writing, one of those three-bedroom cooperative apartments is on the market for $15.5 million. 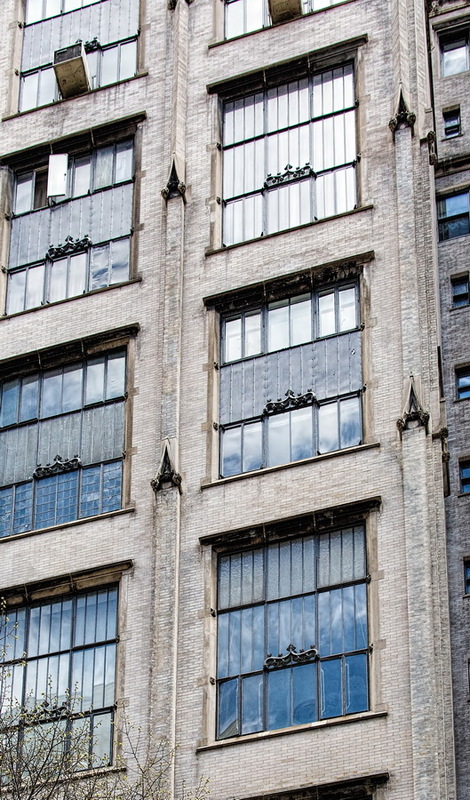 The mid-block building overlooks the Museum of Natural History on wide W 77th Street; the views more spectacular because living rooms (originally studios) are double height with floor-to-ceiling windows. 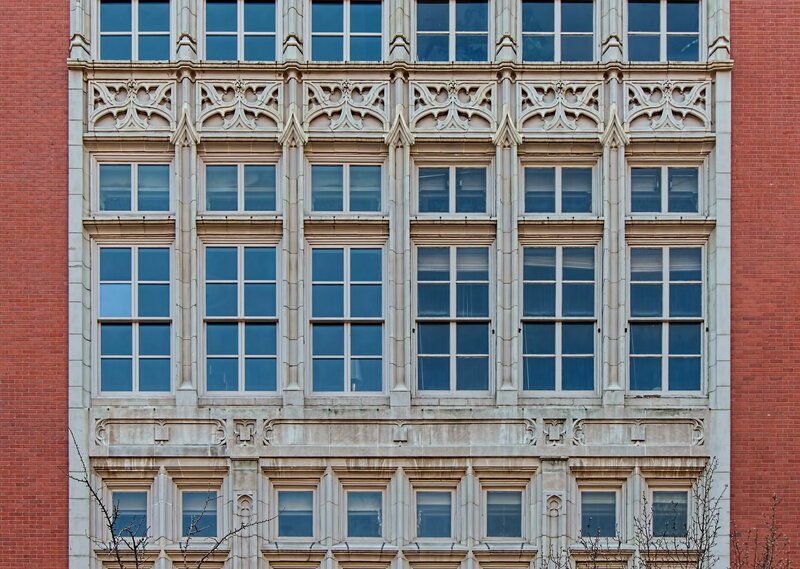 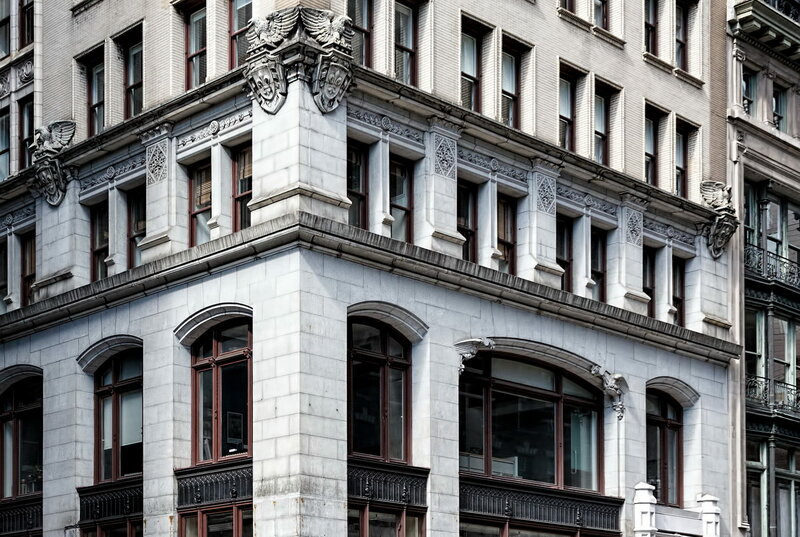 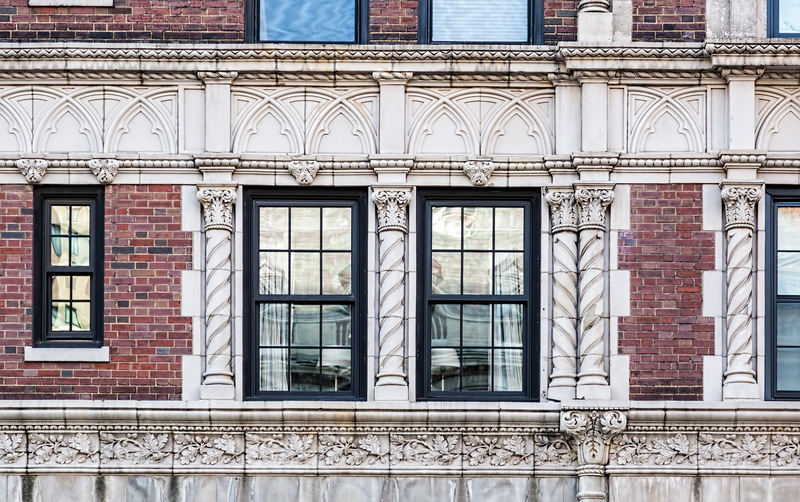 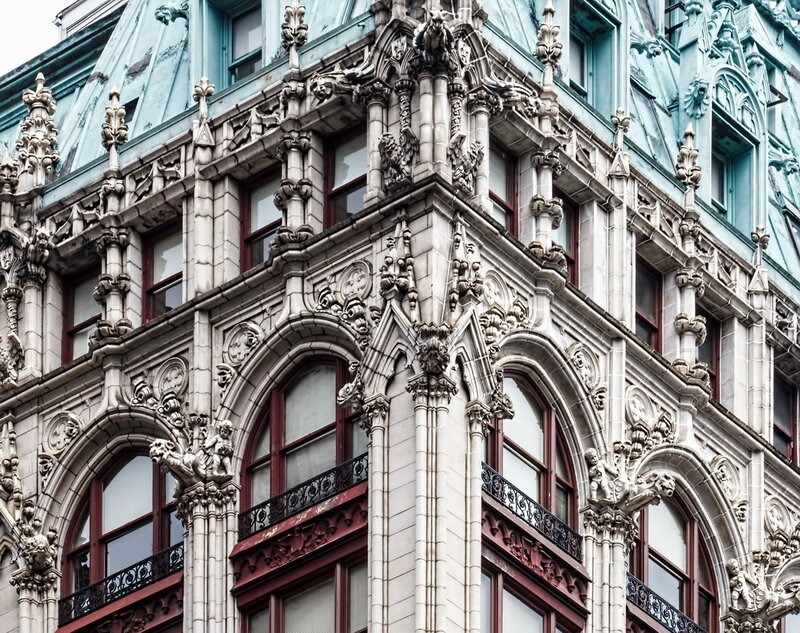 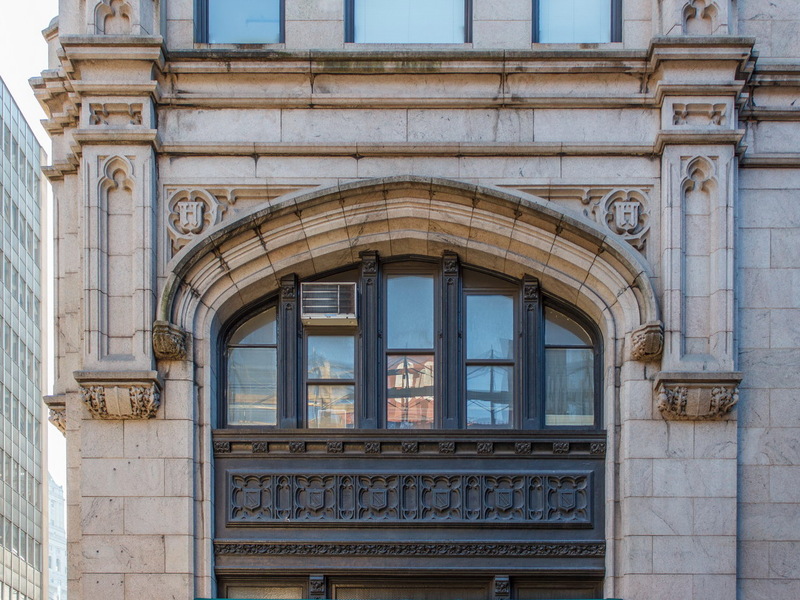 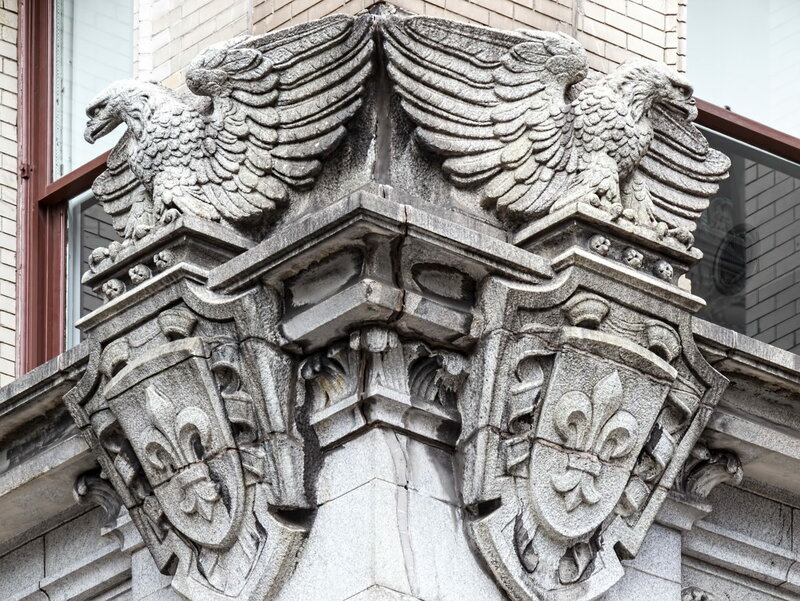 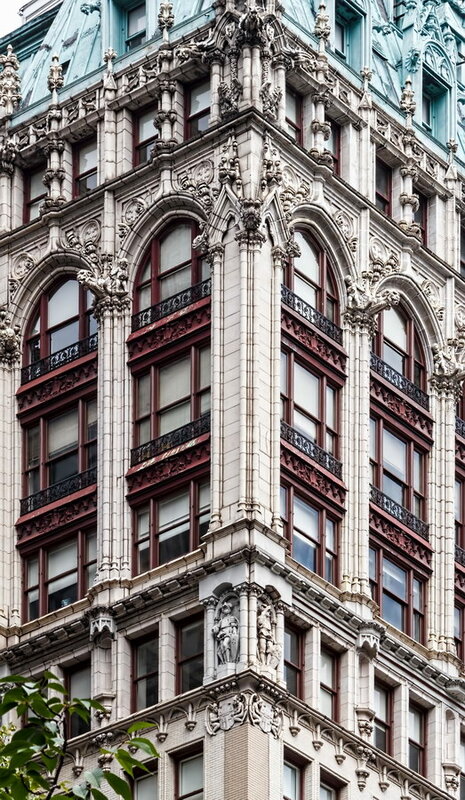 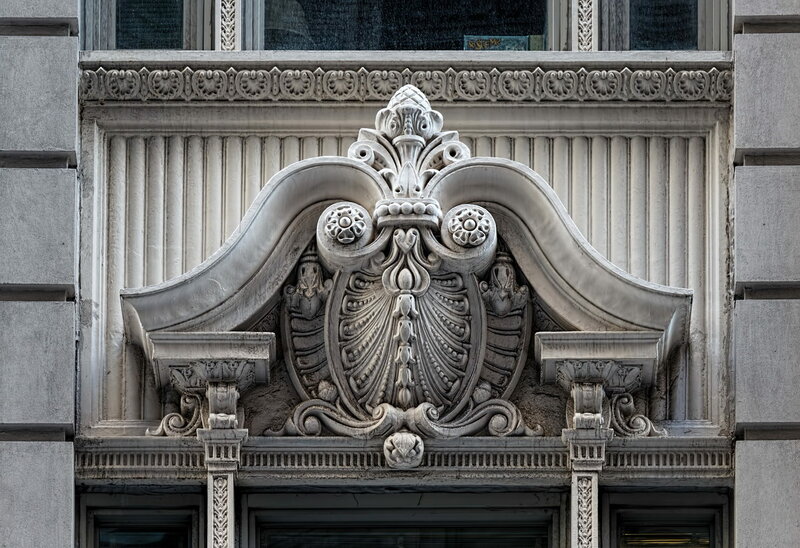 The building’s original facade was even more ornate – there was a massive oriel projecting from the top three floors, and an elaborate cornice that added a story to the building’s height. 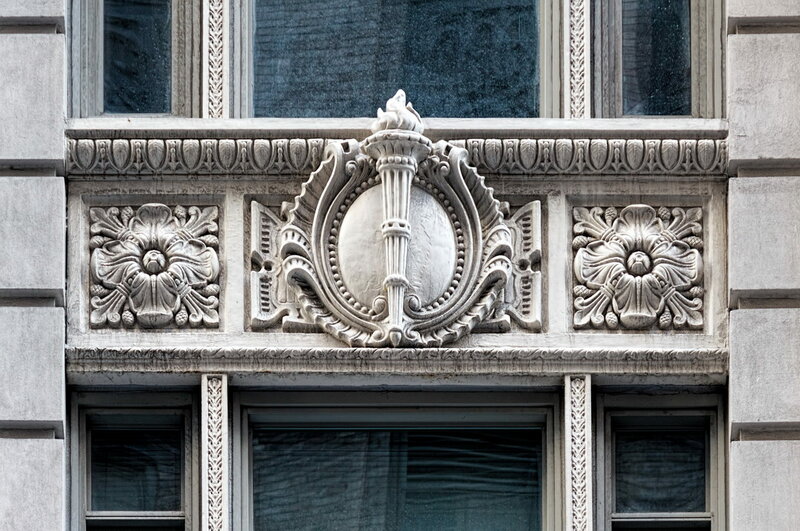 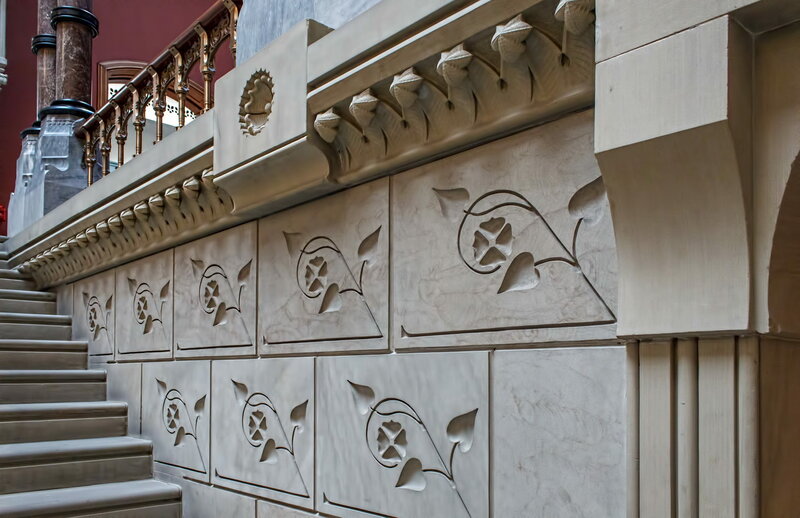 The New York Times notes that three quarters of the original ornament was stripped in the 1940s. 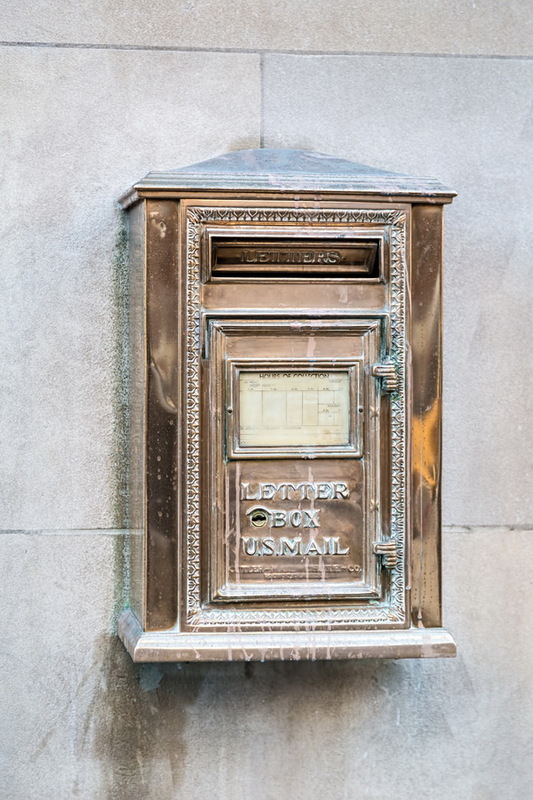 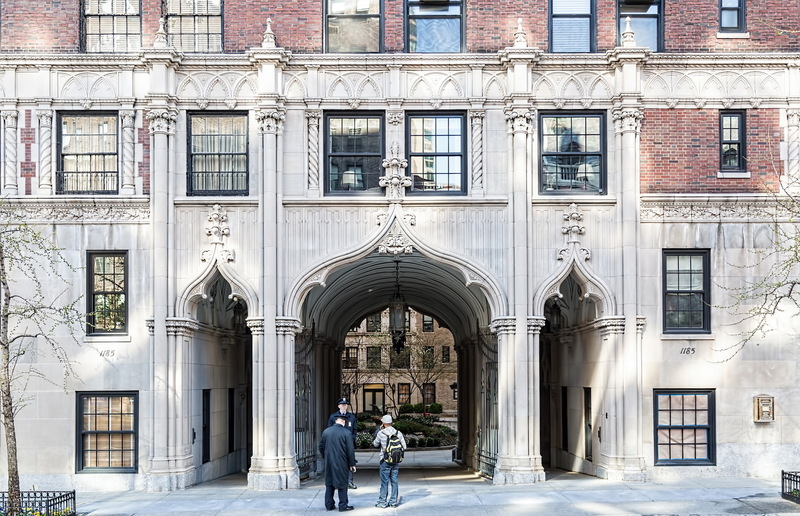 The architects – Herbert Spencer Harde and Richard Thomas Short – had a brief but showy partnership that resulted in four landmarked buildings: this and Red House, Alwyn Court, and 45 E 66th Street. 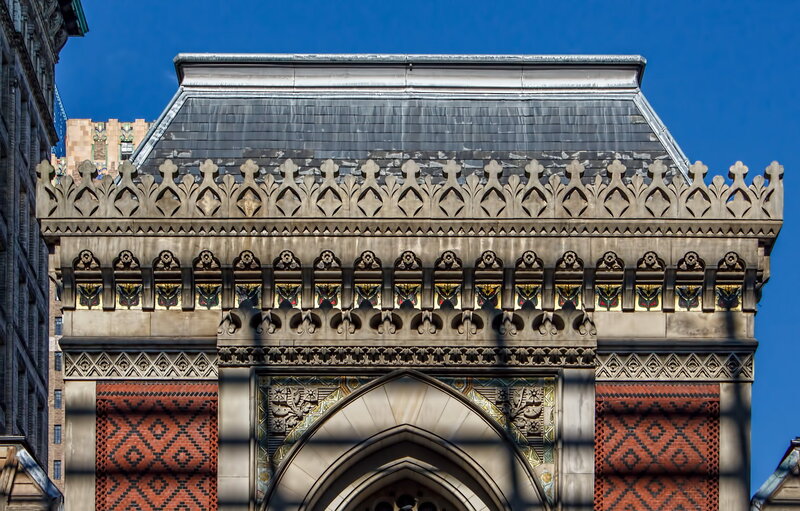 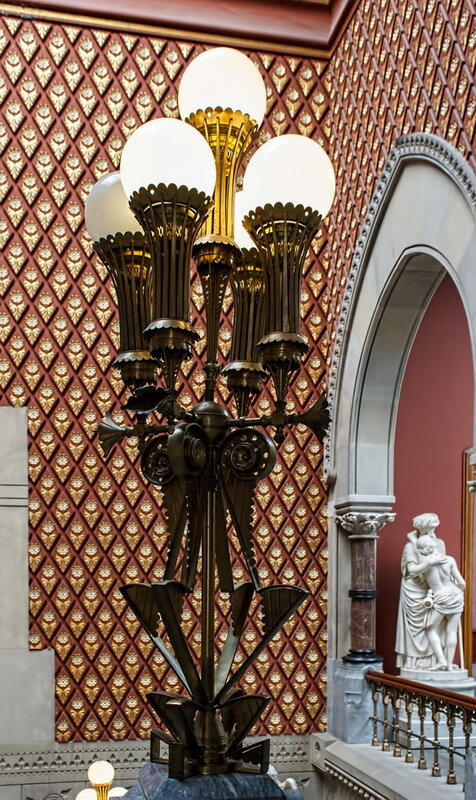 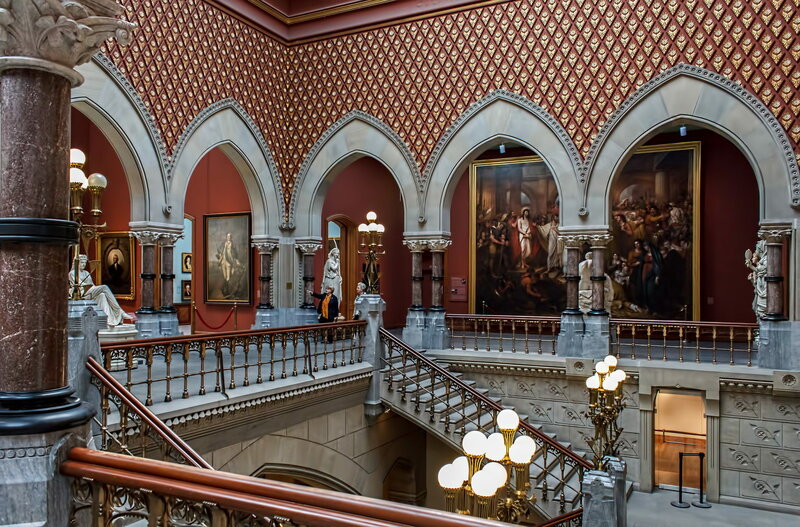 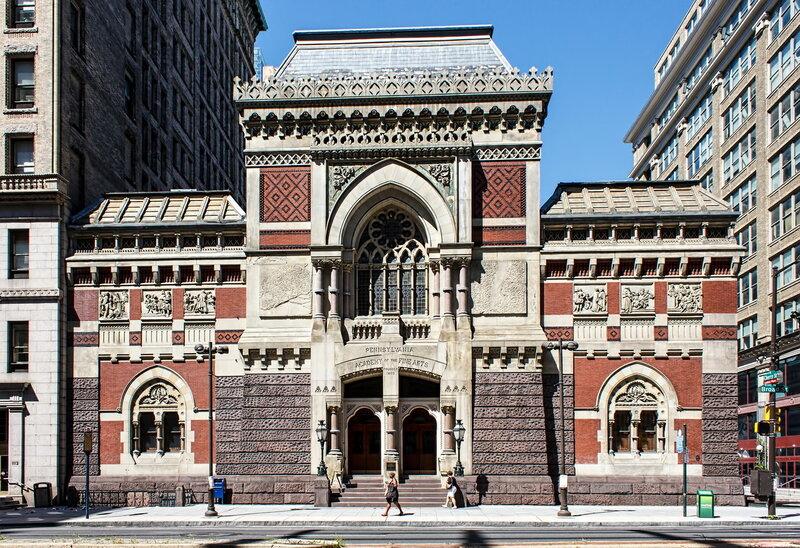 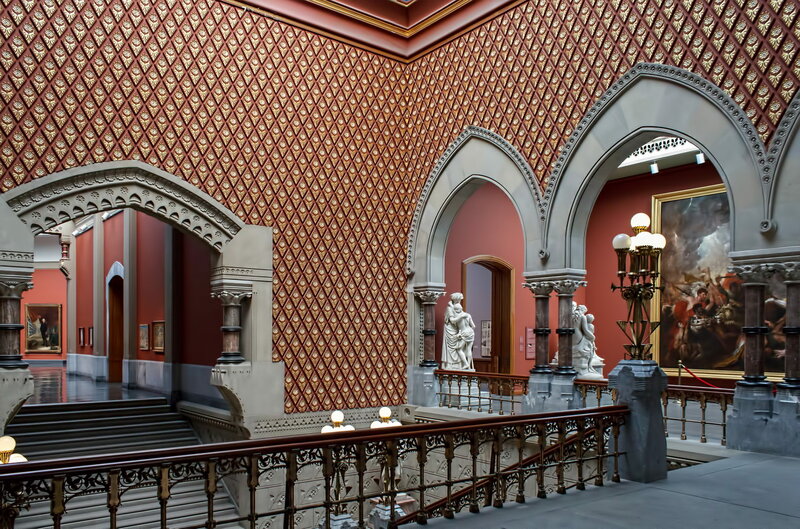 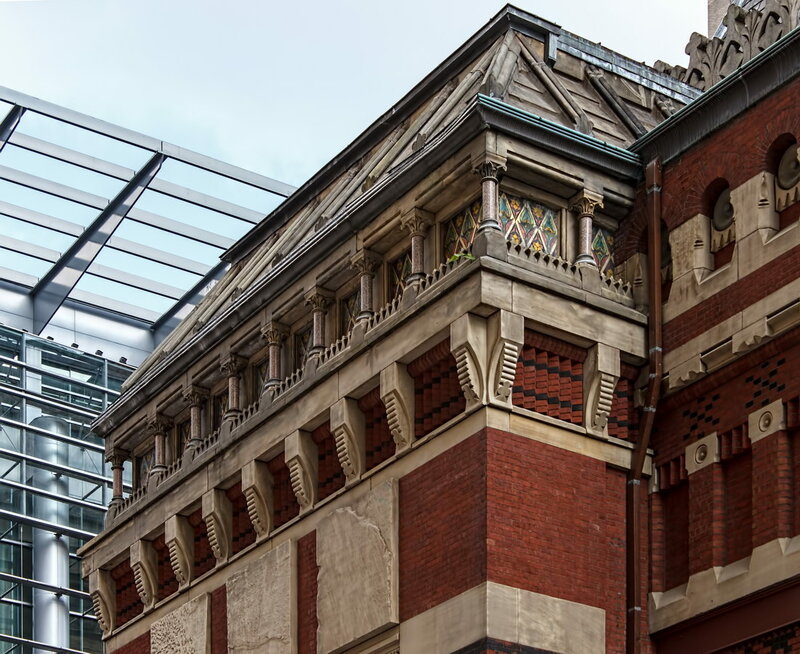 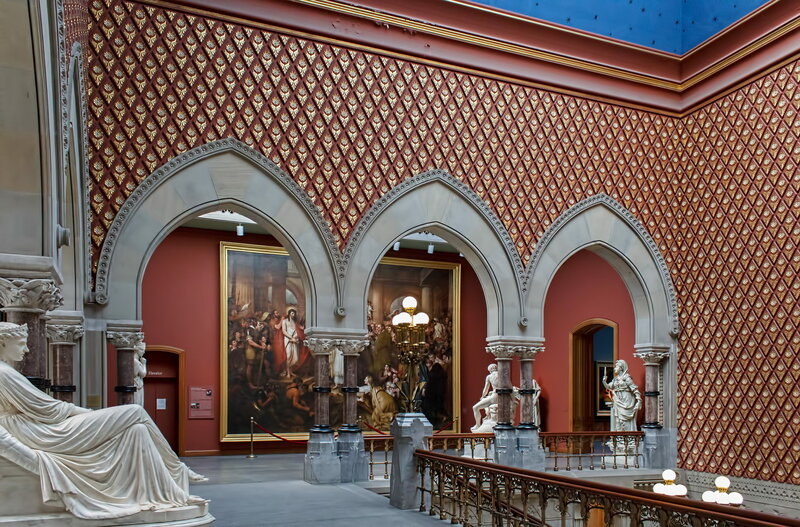 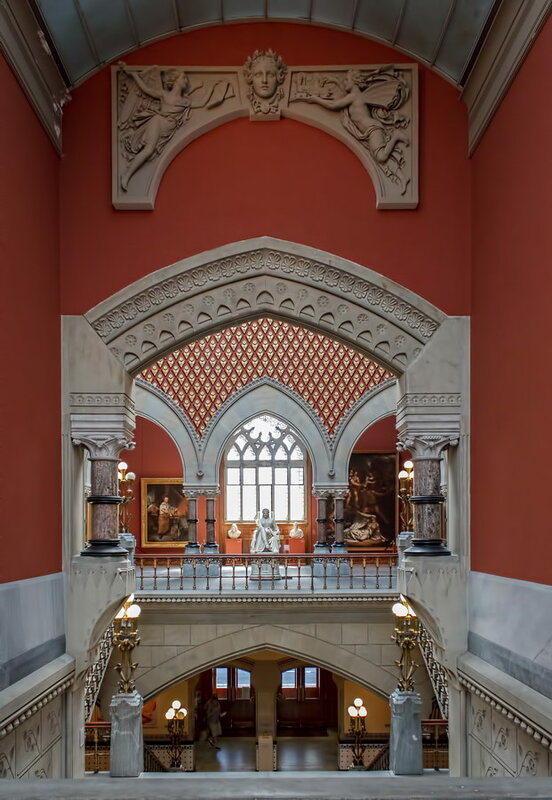 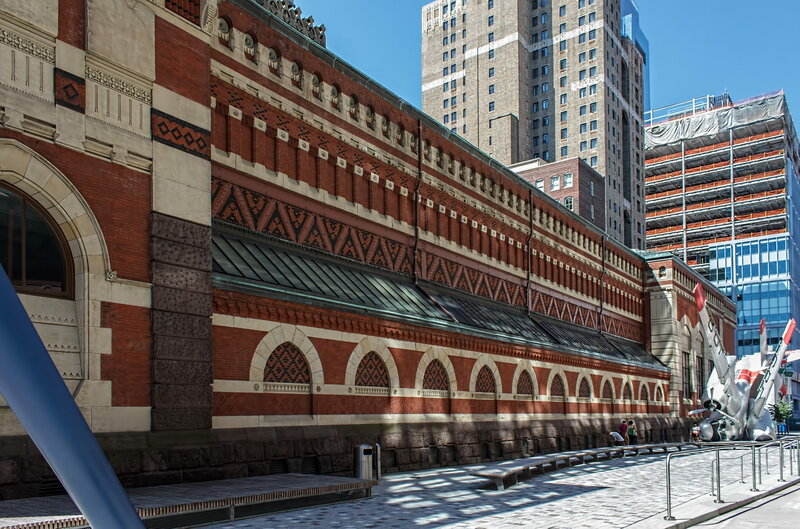 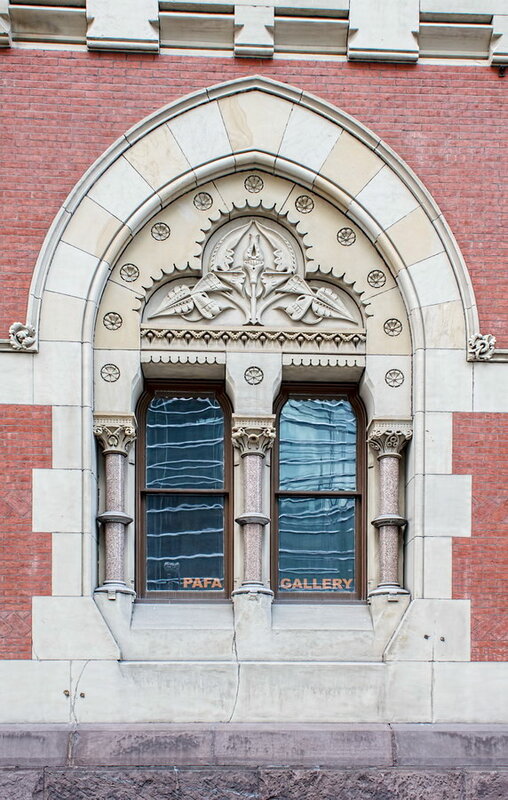 February 20, 2015 Philadelphia118 N Broad Street, 1876, city center, Frank Furness, Furness-Hewitt Building, George Hewitt, neo-gothic, PAFA, Philadelphia. 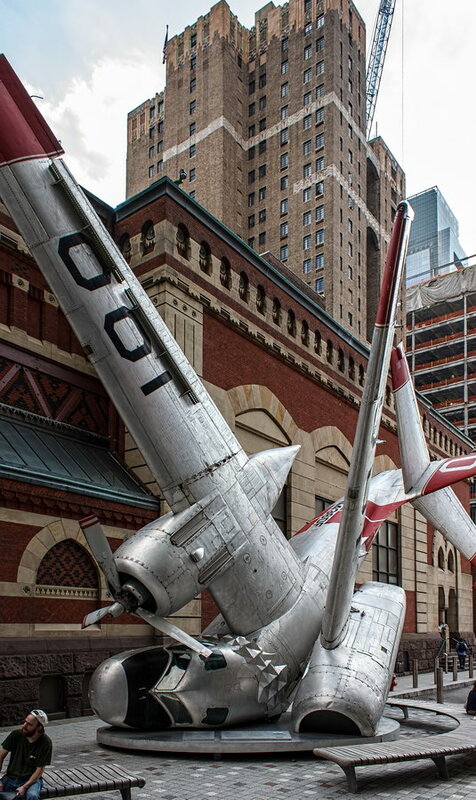 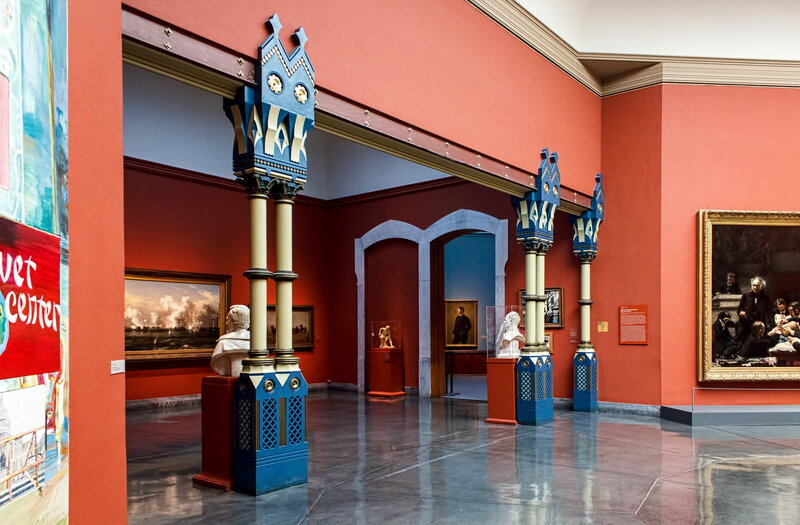 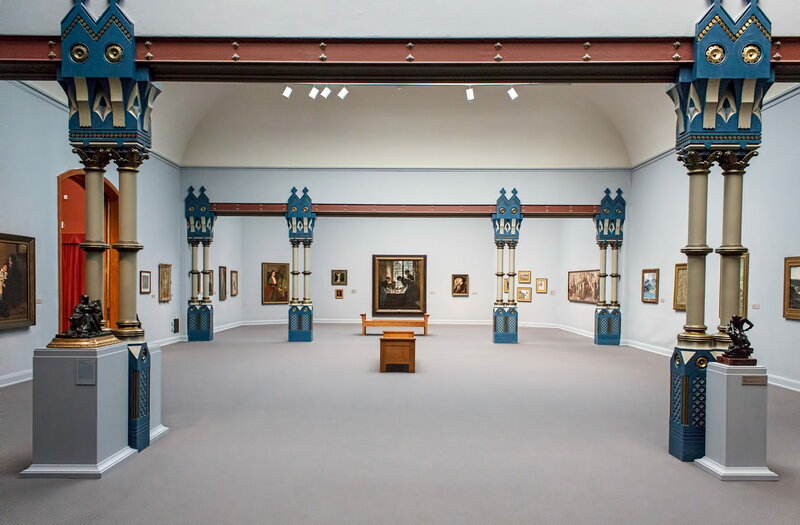 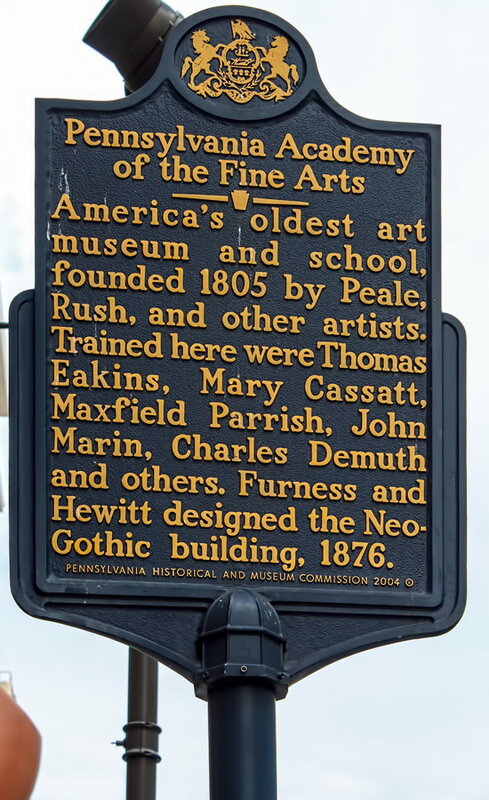 The Pennsylvania Academy of the Fine Arts (PAFA) is the oldest art museum and school in the United States, dating back to 1805. 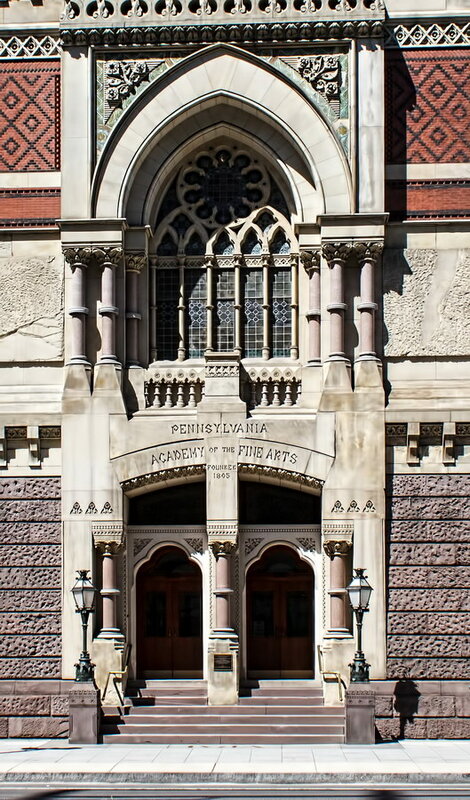 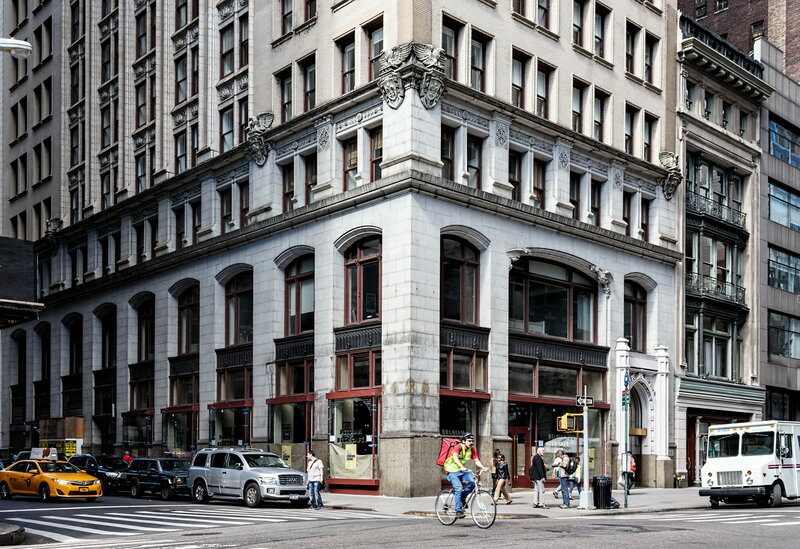 The Furness-Hewitt Building, completed in 1876, replaces the Academy’s first buildings on Chestnut Street, which the museum outgrew. 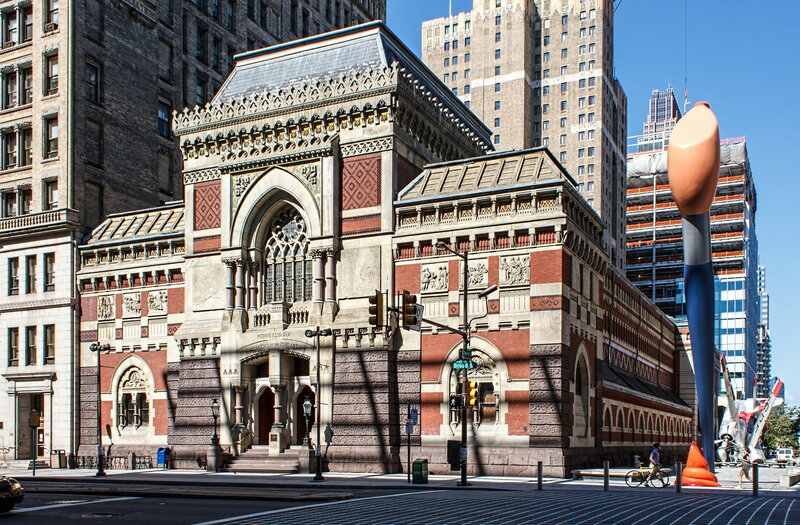 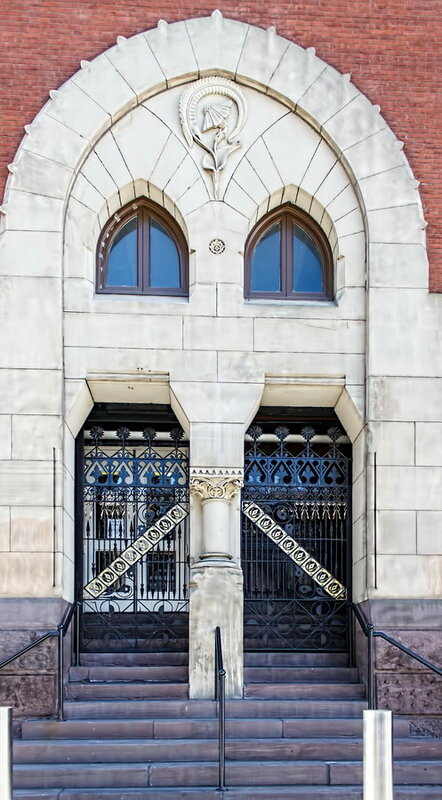 The structure is widely regarded as architect Frank Furness’ masterpiece, and was controversial when built. 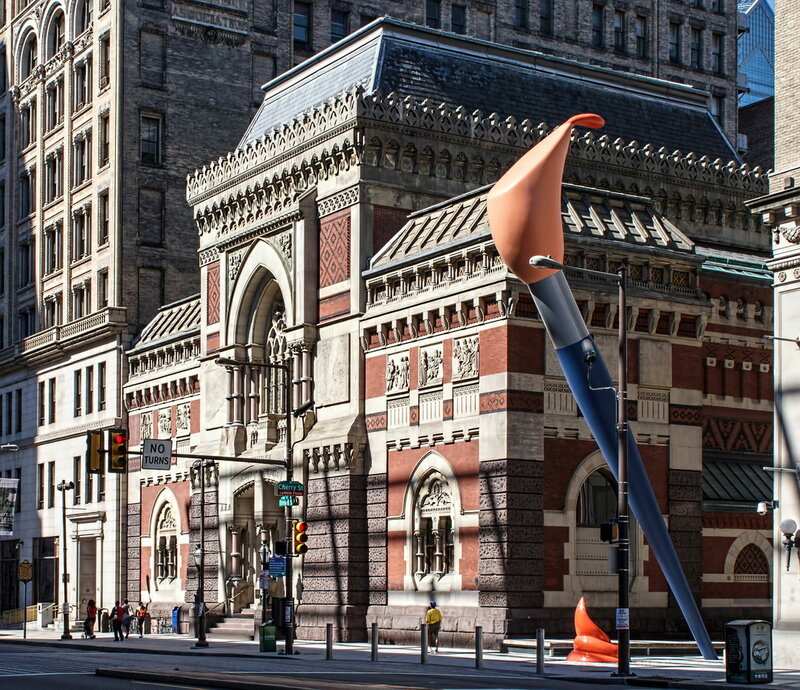 Contrast and color, as much as form, make PAFA’s museum so striking. 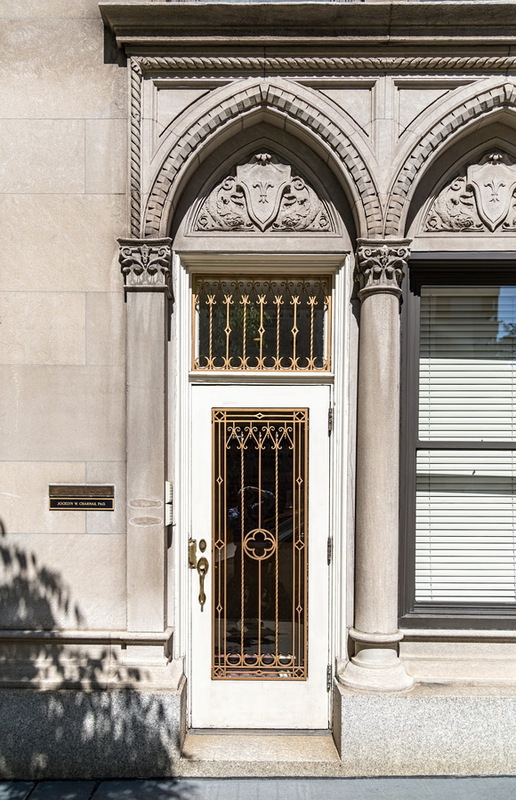 The white limestone arches rest on brownstone bases; the brick infill is patterns of red and black. 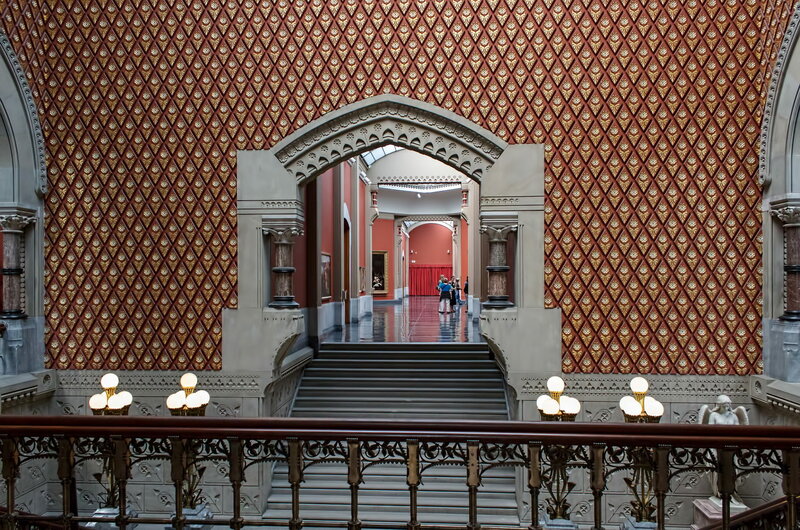 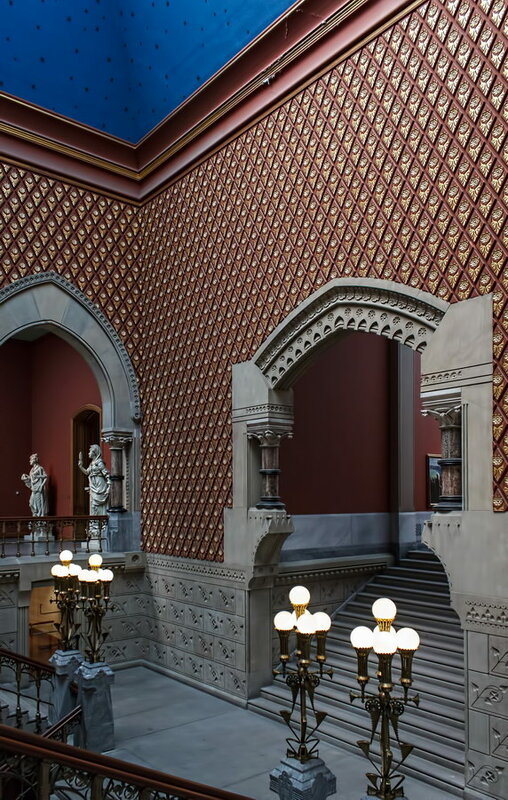 The Furness-Hewitt Building interior is as grand and ornate as the exterior: The central staircase rises through an opulent four-story atrium ringed by marble arches, columns, statuary and gilt-on-red floral patterned walls, under a cerulean blue ceiling sprinkled with silver stars. 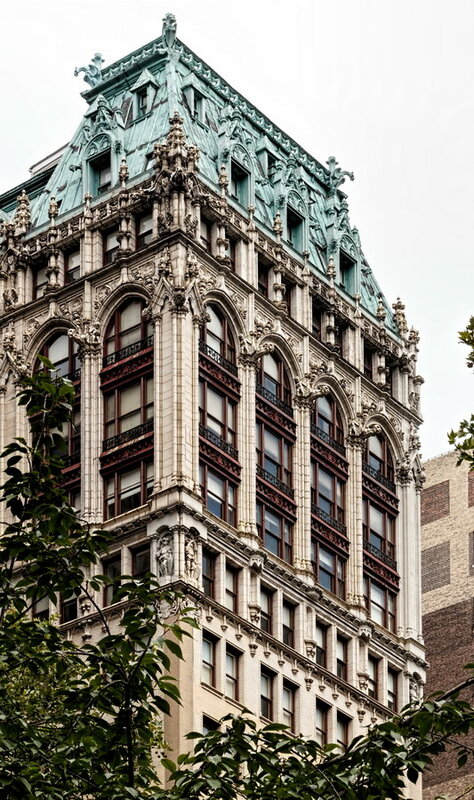 Much of the opulence had been covered up in the first half of the 1900s, but the building was restored to its original glory for its centennial, in 1976. 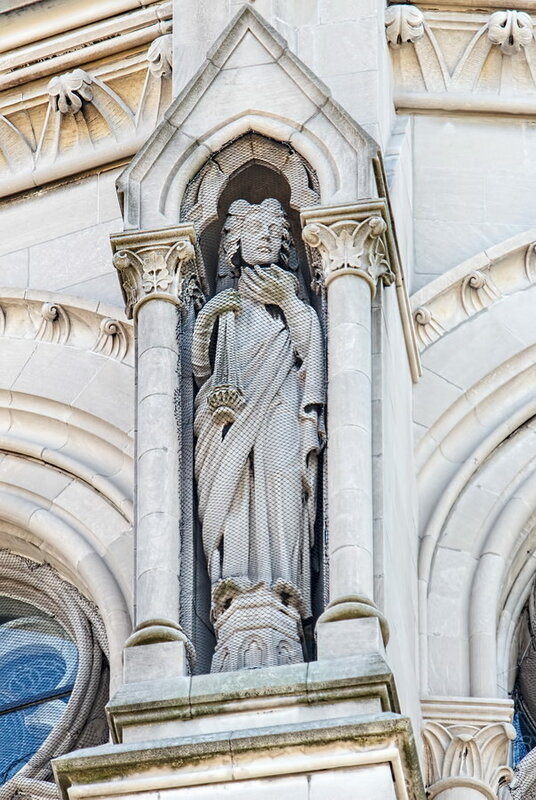 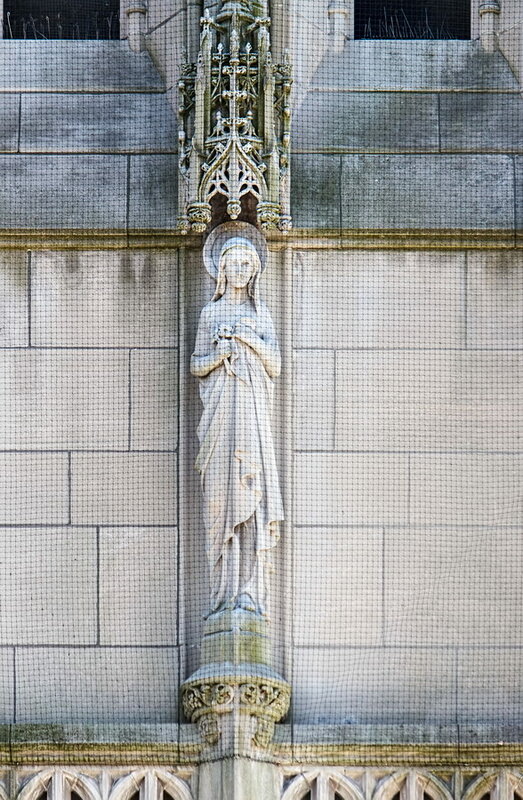 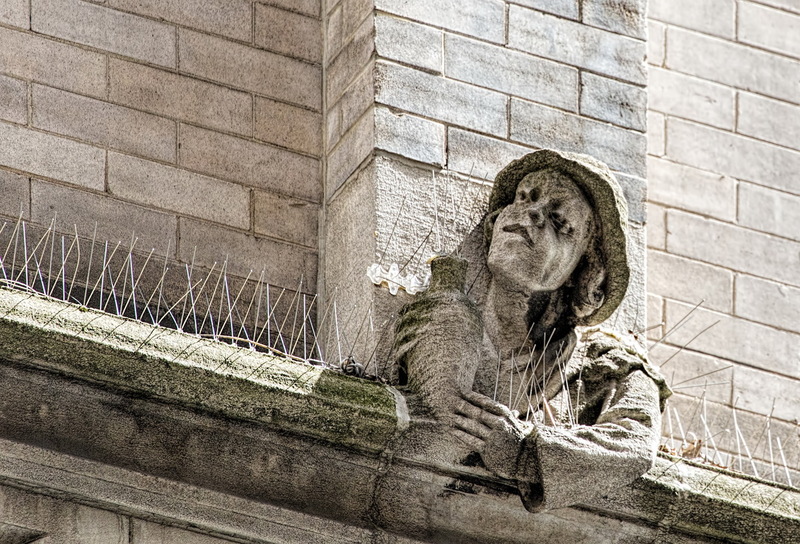 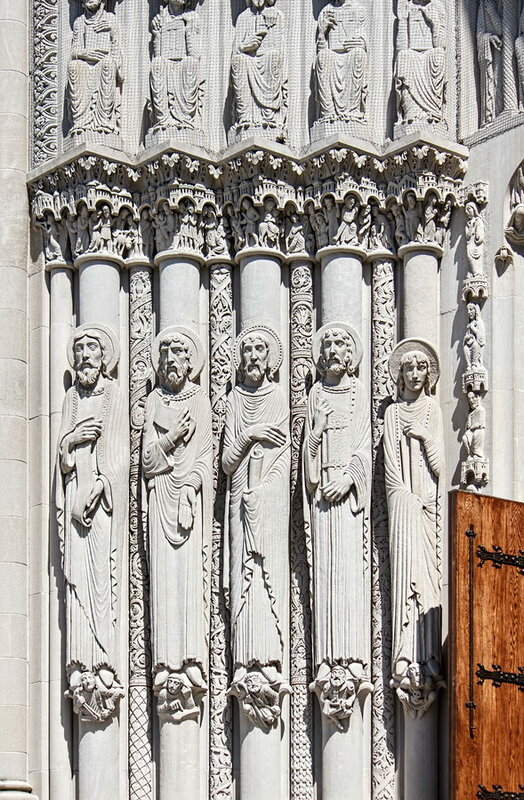 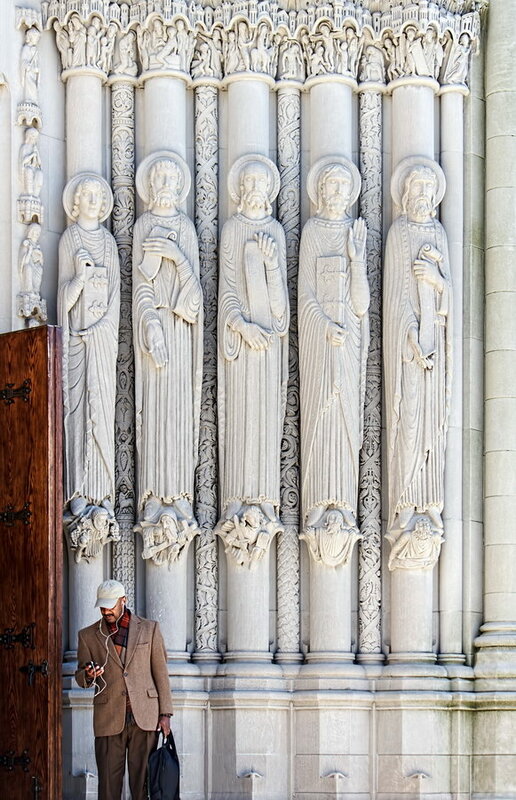 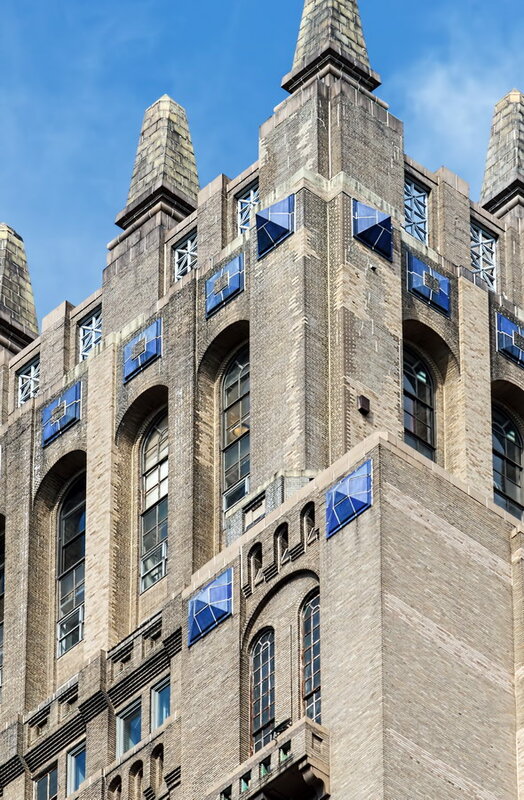 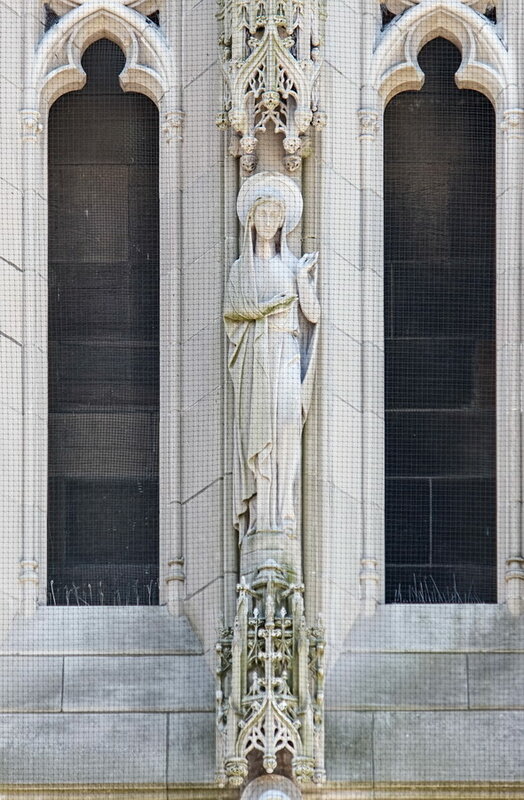 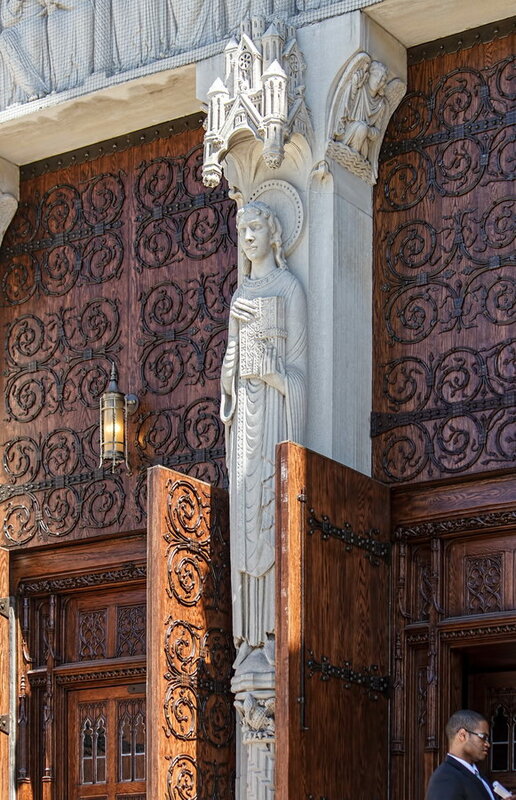 February 20, 2015 Manhattan1930, 490 Riverside Drive, charles collens, church, henry c. pelton, historic, landmark, Manhattan, neo-gothic, New York City. 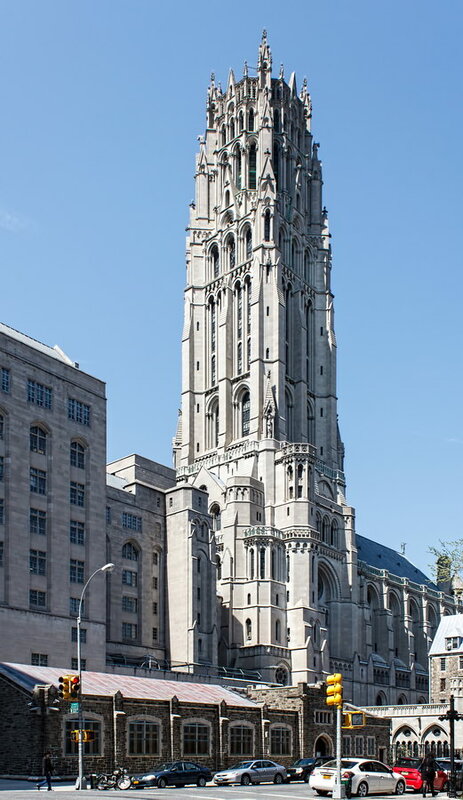 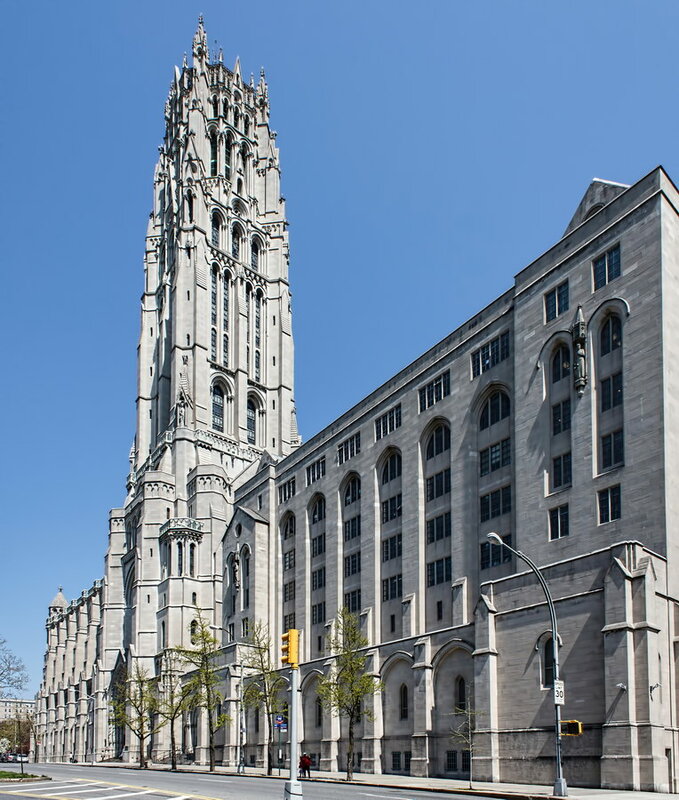 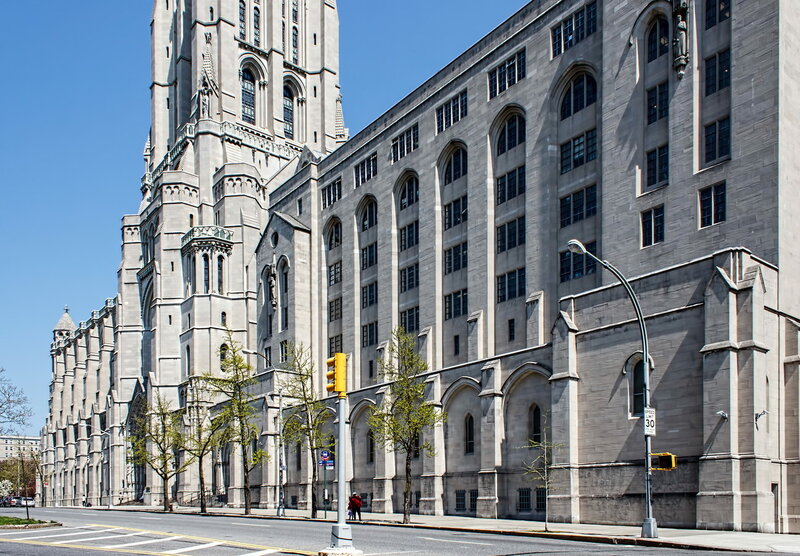 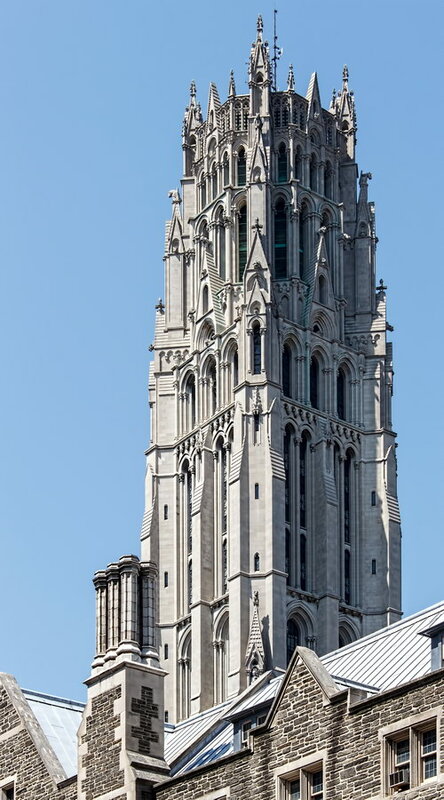 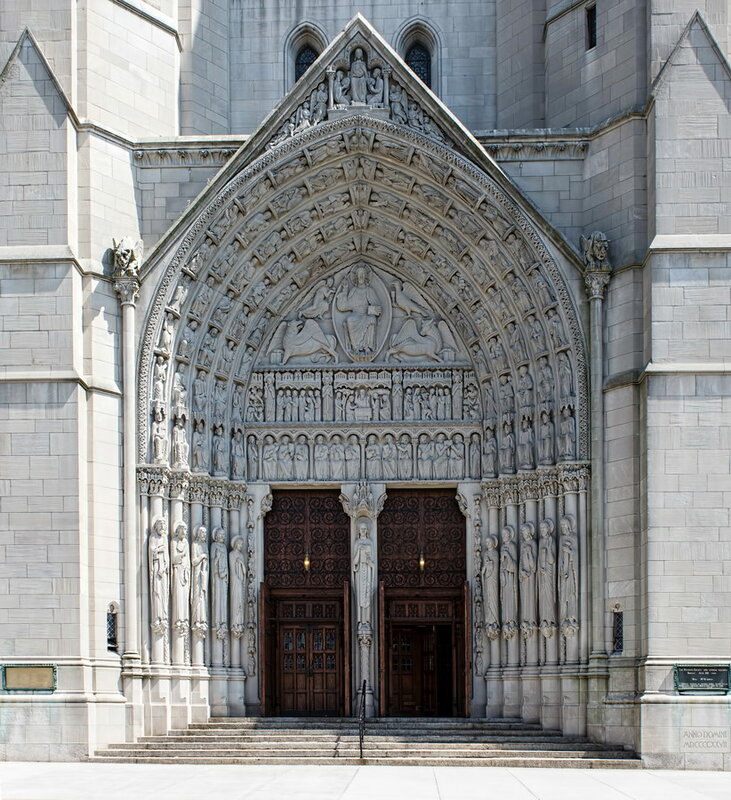 Although Riverside Church is designed in the Gothic style, it is structurally modern: A steel frame, not the too-shallow buttresses, supports the weight of the tower. 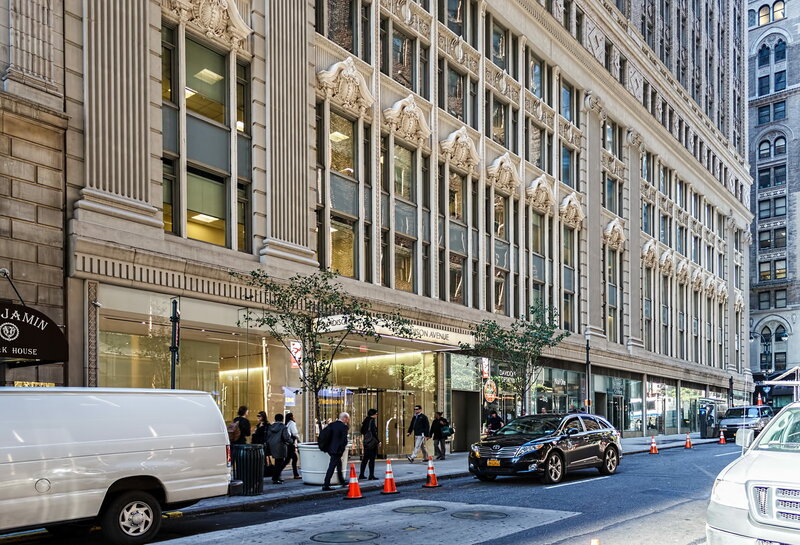 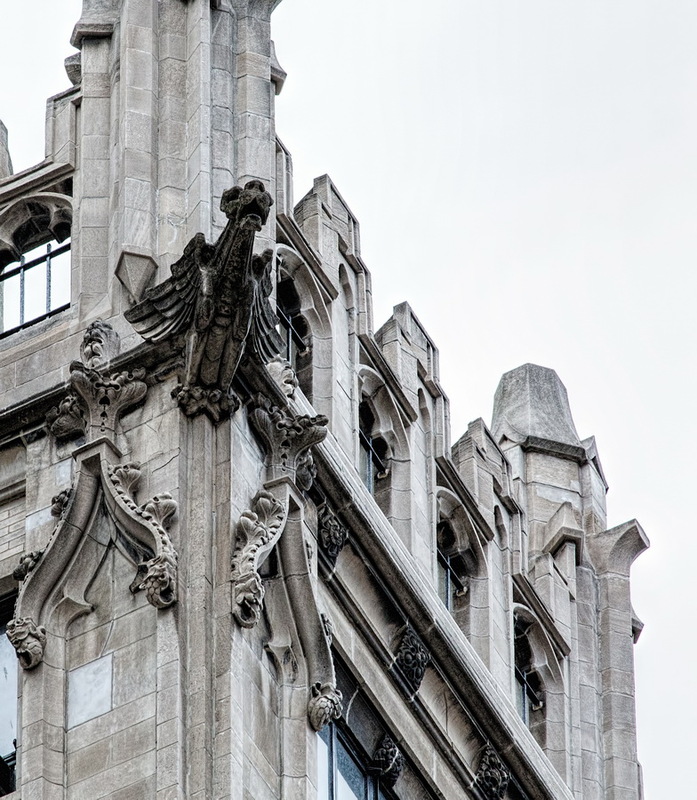 February 20, 2015 Manhattan1930, 295 Madison Avenue, Bark & Djorup, Charles F. Moyer Co., commercial, Manhattan, midtown, neo-gothic, New York City. 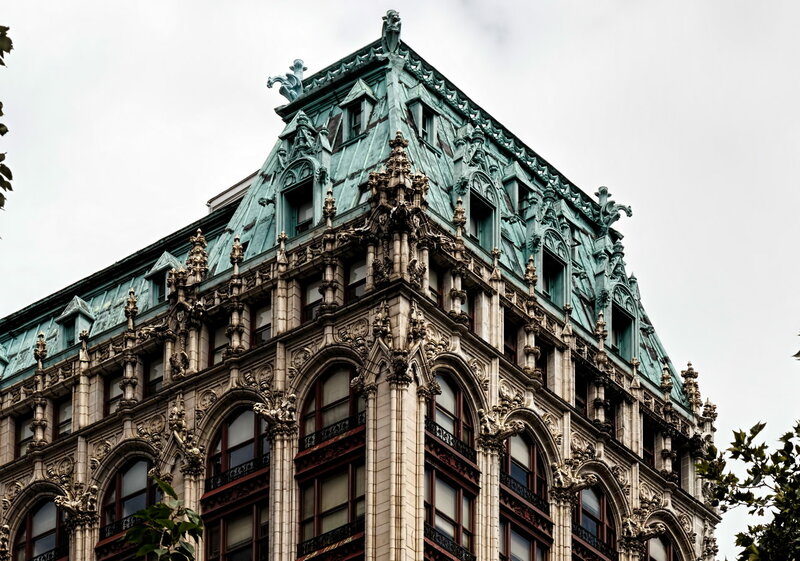 Lefcourt Colonial Building was among the last buildings developed by Abraham Lefcourt, one of New York’s “rags to riches to rags” stories. 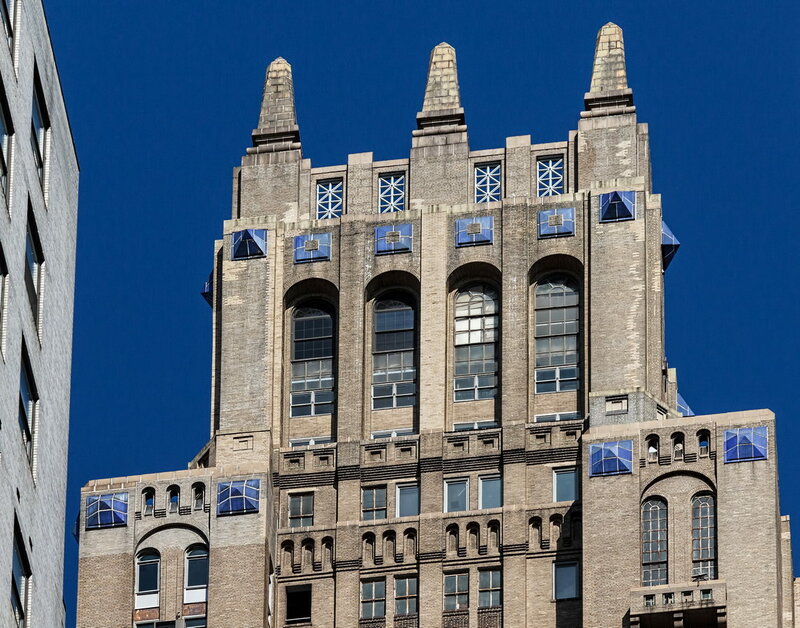 Now known as 295 Madison Avenue, the 45-story Neo-Gothic tower is an architectural landmark without the official title. 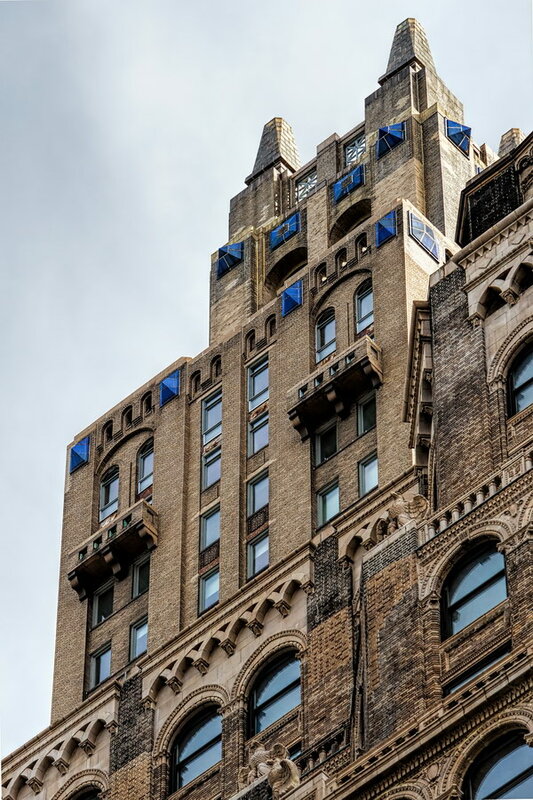 The distinctive blue terra cotta medallions and gilded finials are visible from most of midtown. 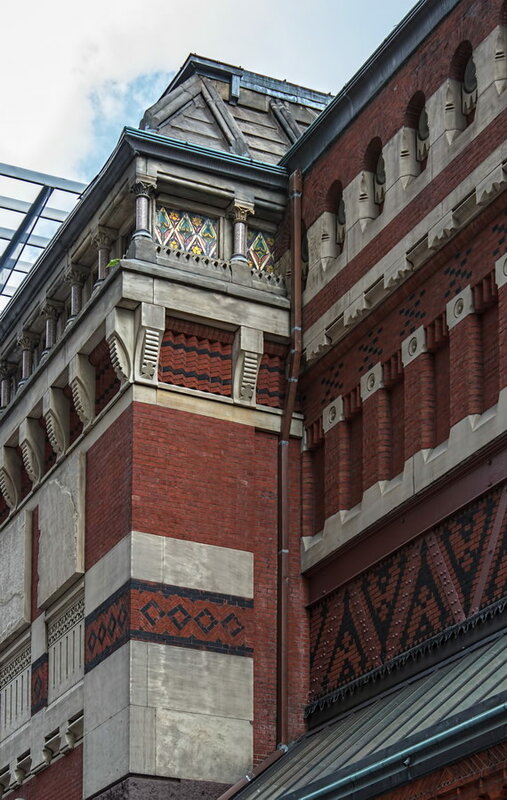 The street level retail space and lobby have been thoroughly modernized, but above that, the six-story base is richly decorated with terra cotta, false balustrades and layered brickwork. 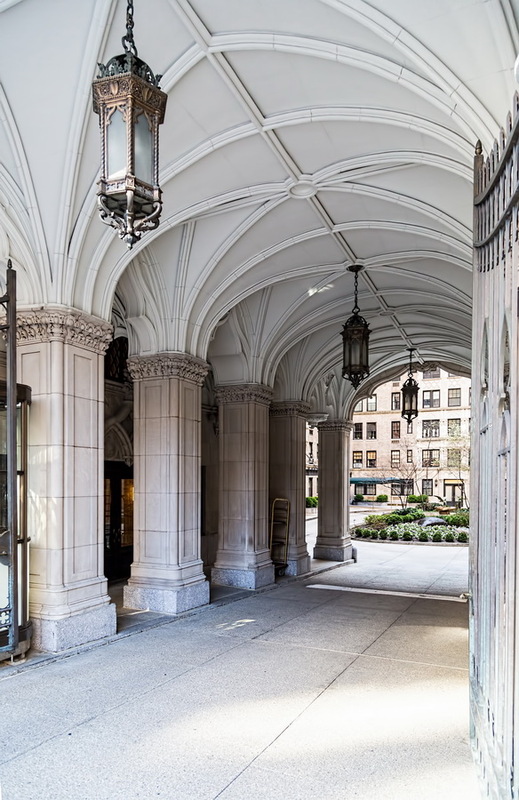 Lefcourt Colonial was auctioned off in foreclosure just two years after it was completed, as the Great Depression demolished Abraham Lefcourt’s real estate and banking empire. 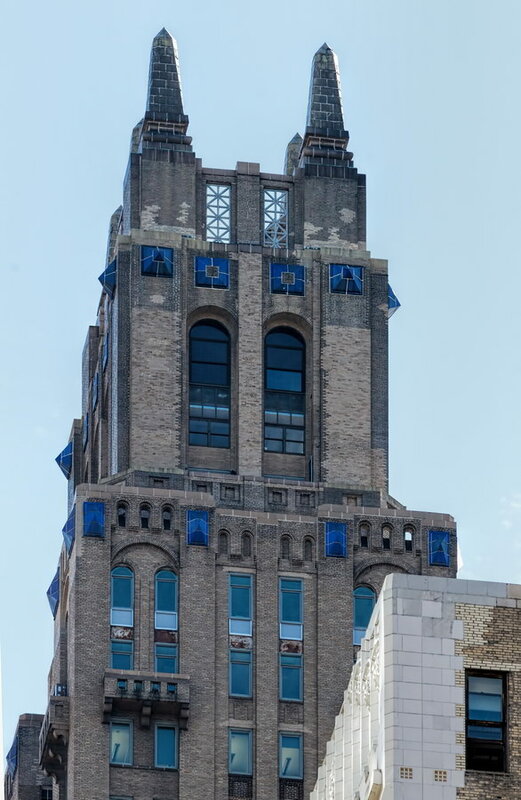 And the day after the Lefcourt Colonial was sold – for $3.5 million – the Sevilla Towers faced the same fate. 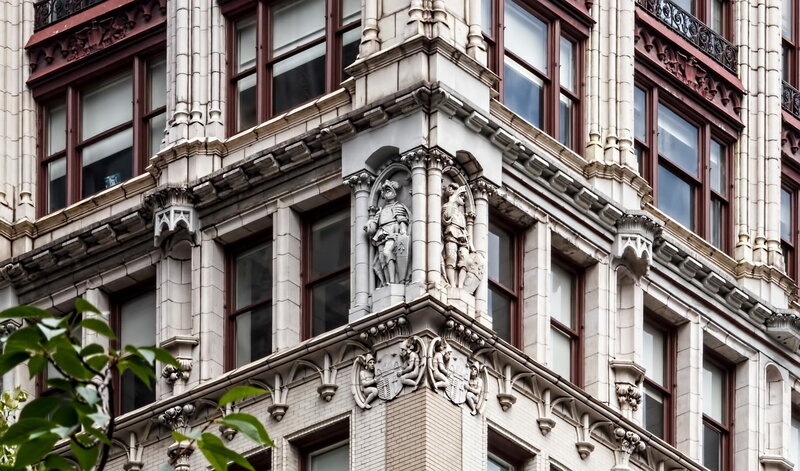 Sevilla Towers was the Lefcourt-built apartment hotel, completed but not yet opened, now known as the Essex House. 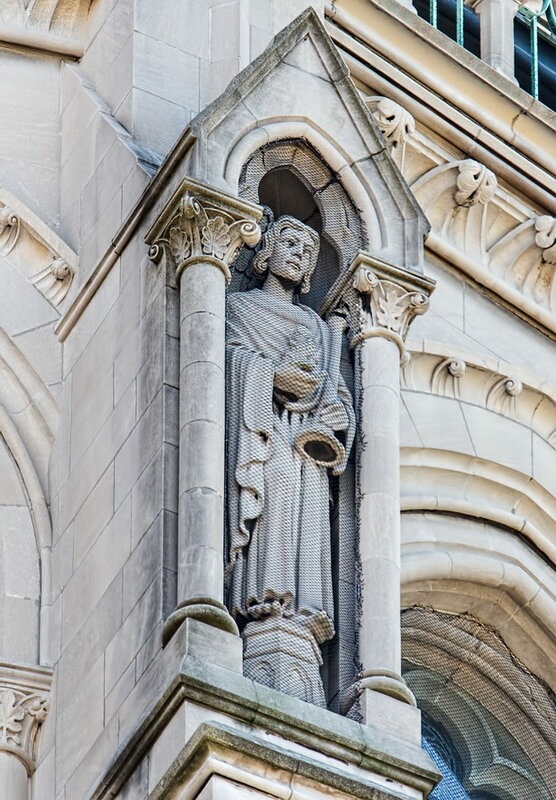 Lefcourt Colonial has something in common with the Empire State Building, Chrysler Building and Statue of Liberty: You can buy a cast replica of the structure! 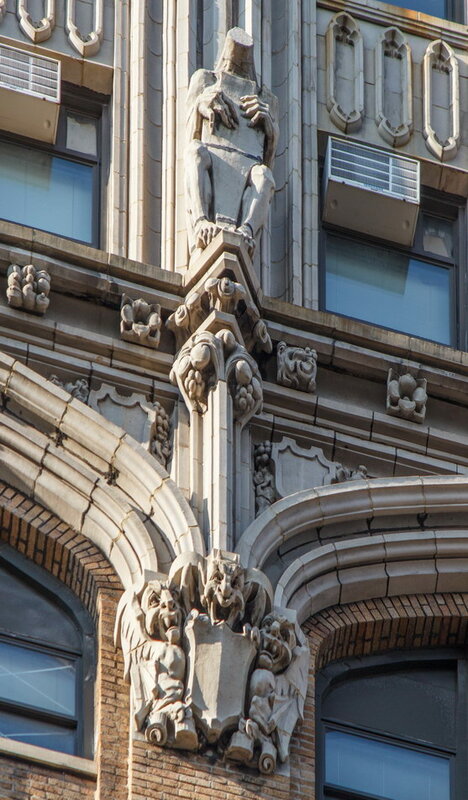 February 20, 2015 Manhattan1912, 220 Fifth Avenue, commercial, Frederick C. Brown, historic, landmark, neo-gothic, New York City. 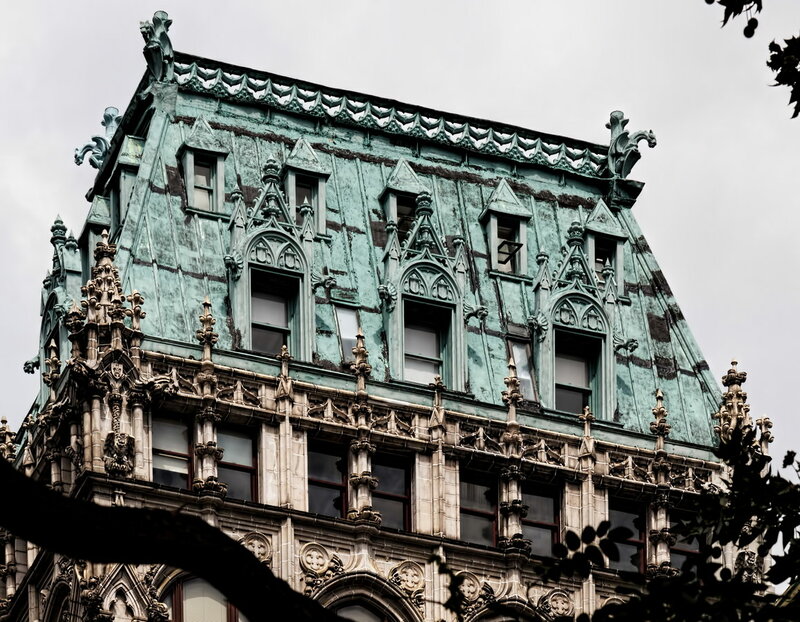 Croisic Building, aka 220 Fifth Avenue, is picturesque Gothic-styled architecture visible for blocks because of its two-story copper mansard roof. 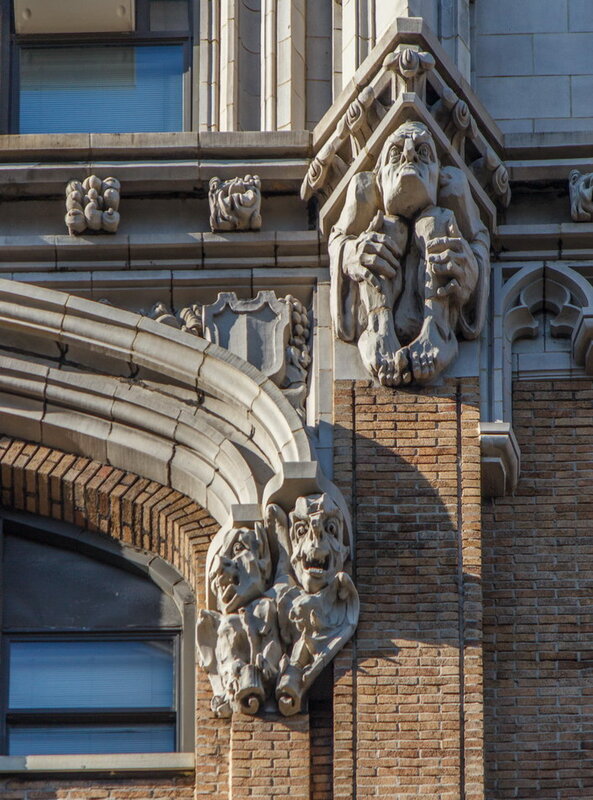 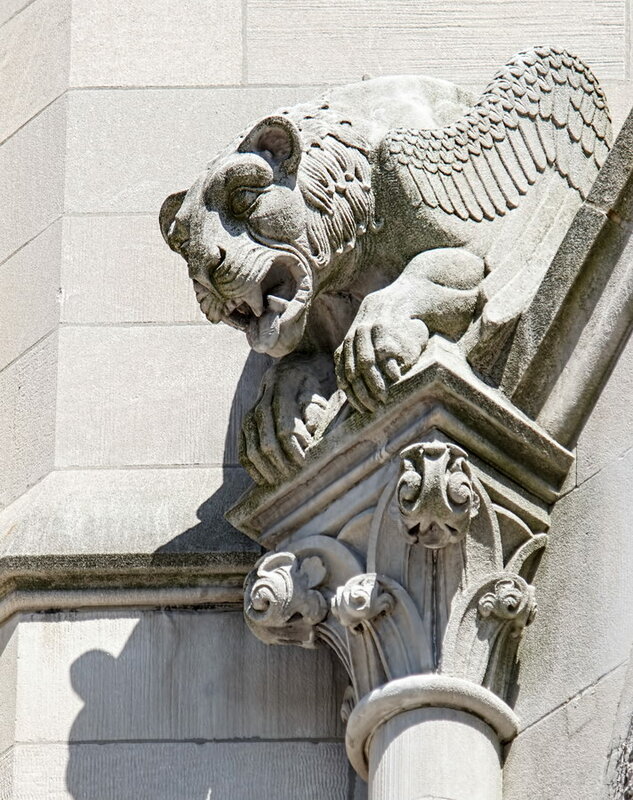 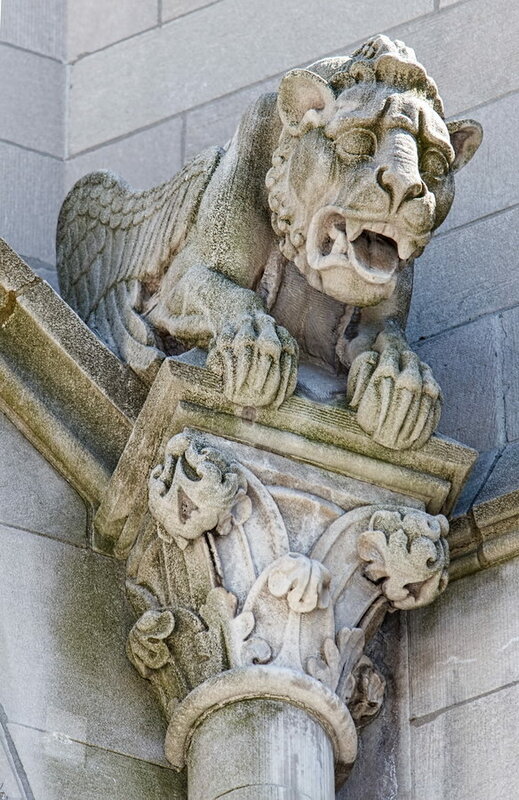 On closer inspection, the terra cotta gargoyles, eagles and other decoration are equally impressive. 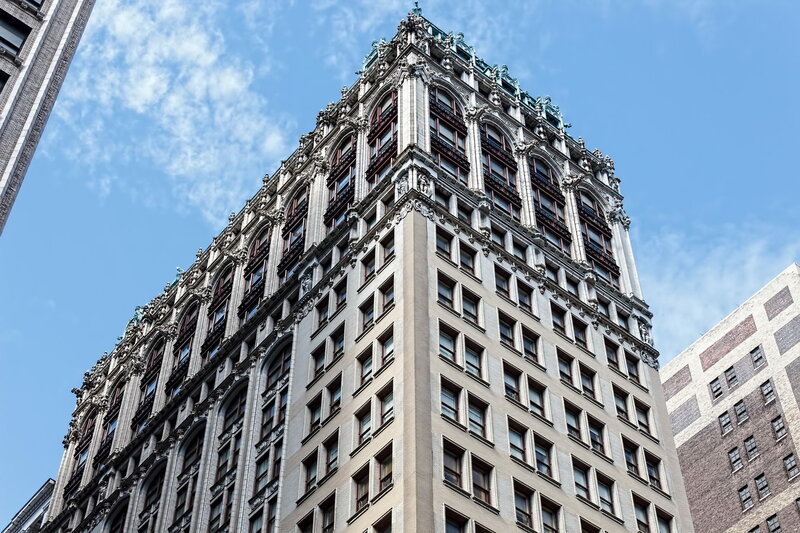 The Flatiron/23rd Street Partnership “Discover Flatiron” brochure claims that actress Ethel Barrymore resided at Croisic Building. 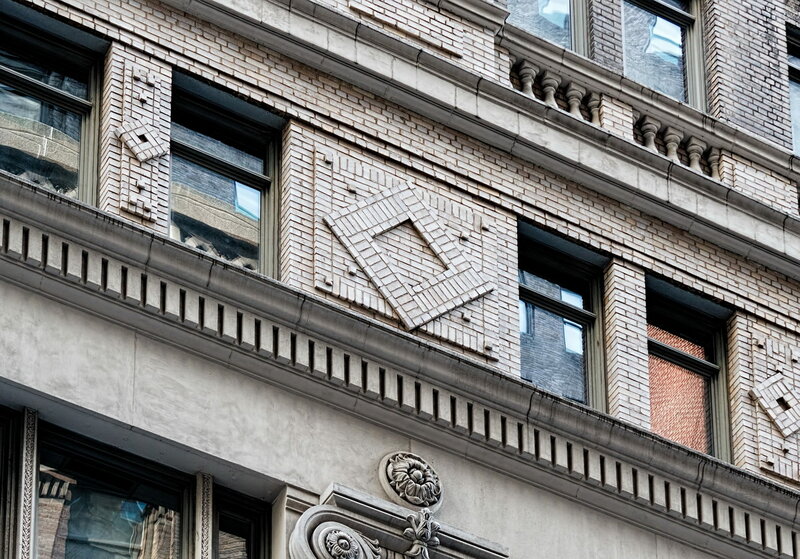 That seems unlikely, because the building was always a commercial office building. 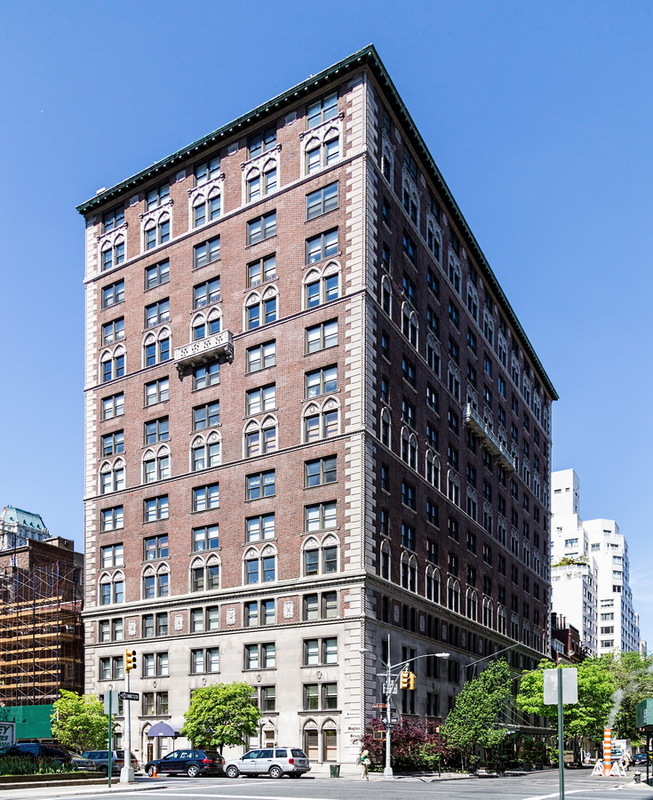 However, some sources say the site was previously occupied by a Croisic apartment hotel, where she might have stayed (her Broadway debut was in 1895, before the current Croisic Building was erected). 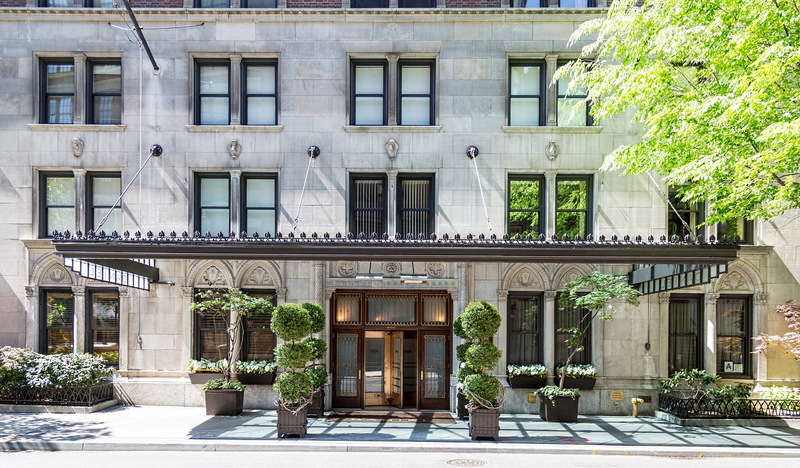 Other sources note that actor Richard Mansfield lived at the hotel. 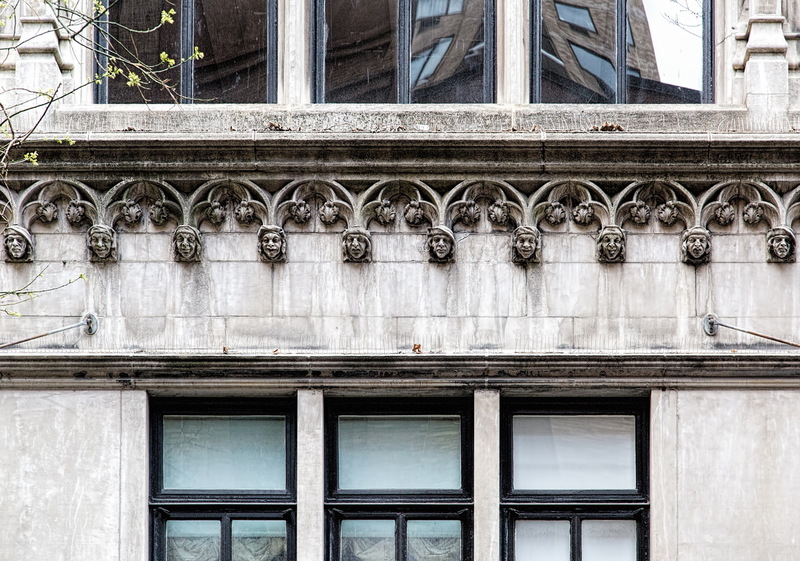 Currently, Croisic Building seems to host a colony of architects – if you Google the address, the first pages are dominated by architect listings. 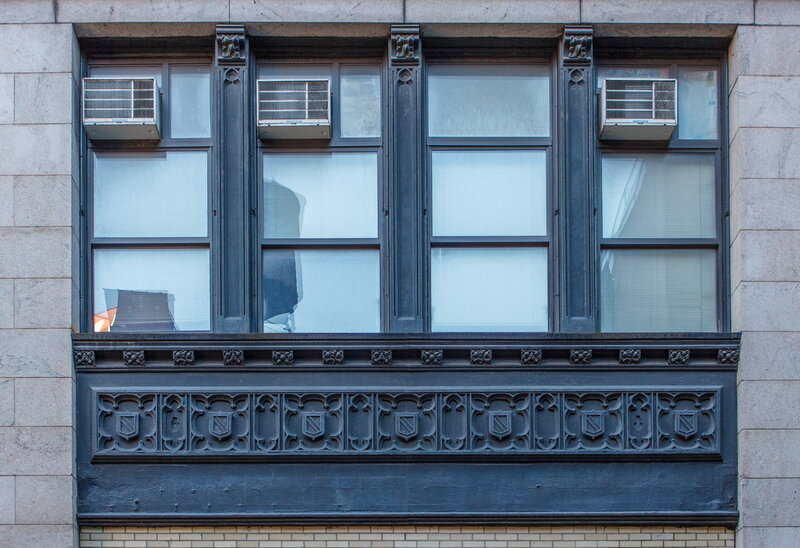 Trivia: According to New York Songlines, Croisic Building is across the street from the nonexistent 221 Fifth Avenue, home of Napoleon Solo, Man From U.N.C.L.E. 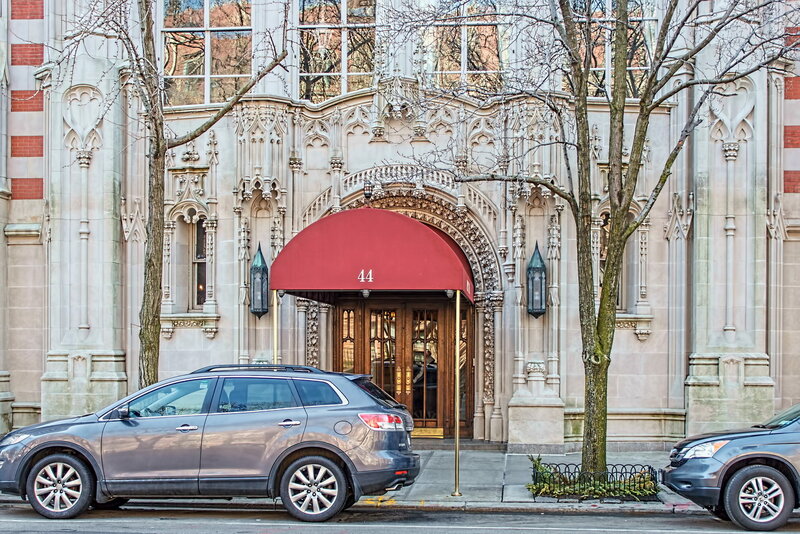 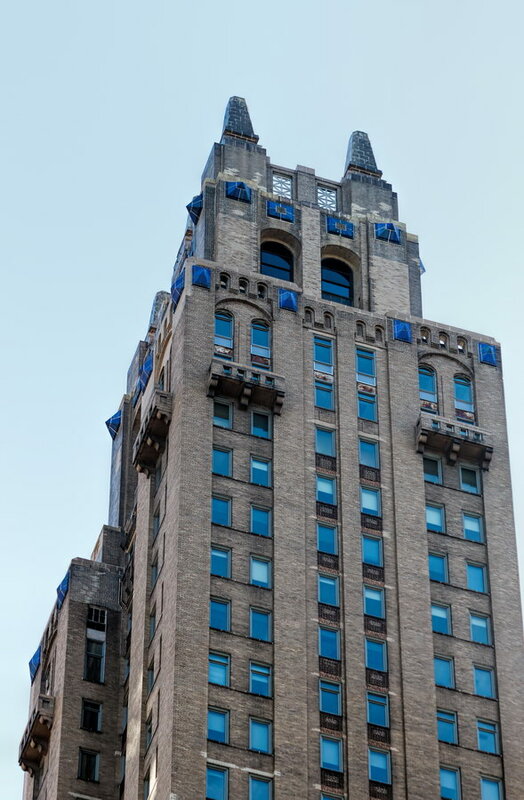 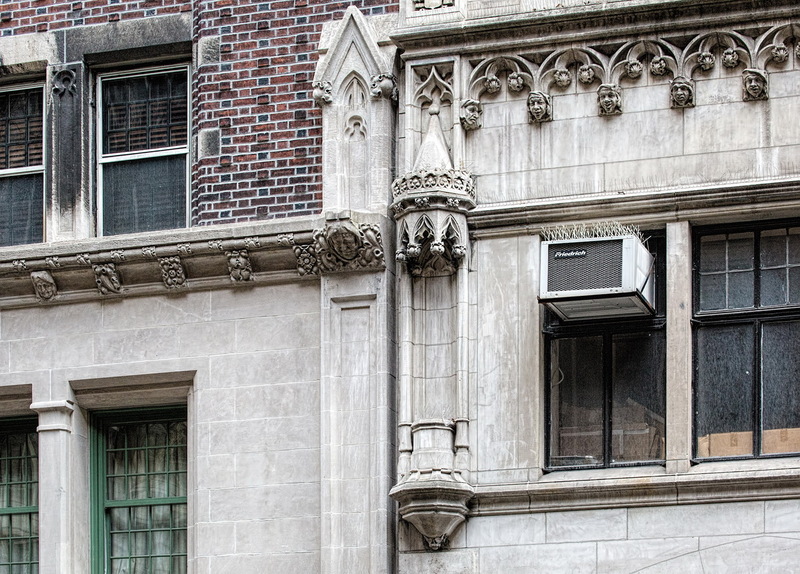 February 13, 2015 Manhattan1 West 67th Street, 1918, architecture, George M. Pollard, Hotel des Artistes, Lincoln Square, Manhattan, neo-gothic, New York City, residential. 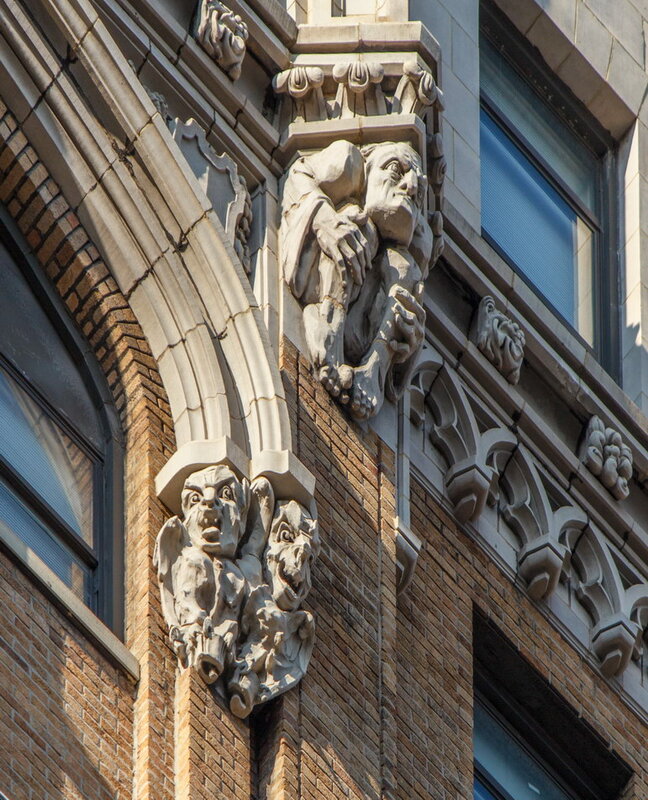 Hotel des Artistes is the most prominent of the eight buildings that make up the West 67th Street Artists’ Colony Historic District, in the National Register of Historic Places. 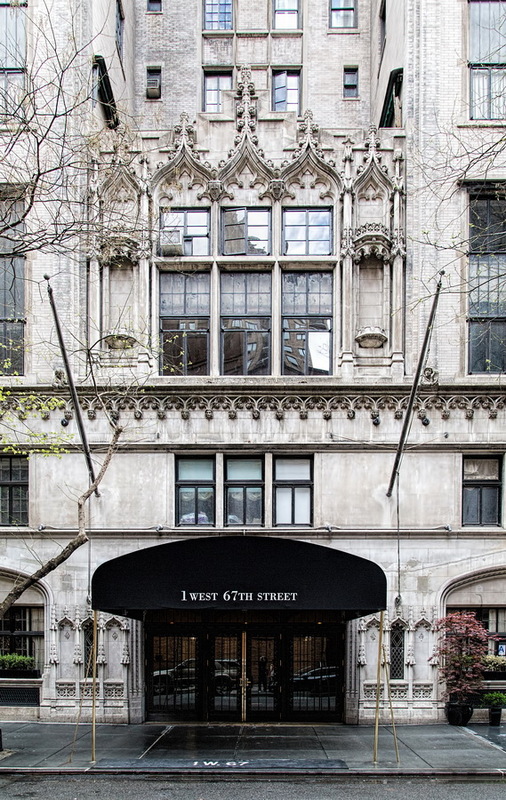 It wasn’t the first, but 1 West 67th Street remains the largest of the studio/apartment buildings. 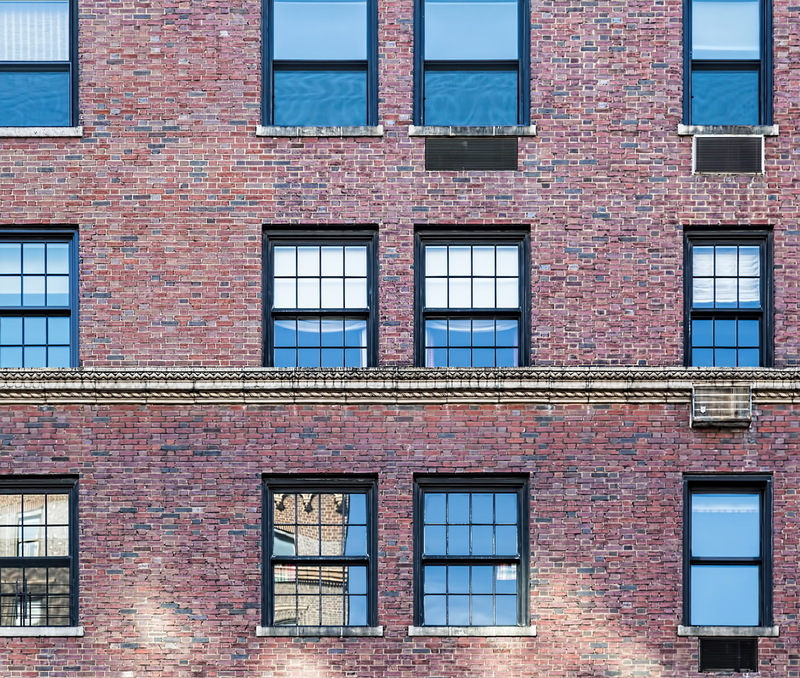 What sets this (and other studio buildings) apart is the double-height studio spaces in each apartment, with double-height windows to give artists ample natural light. 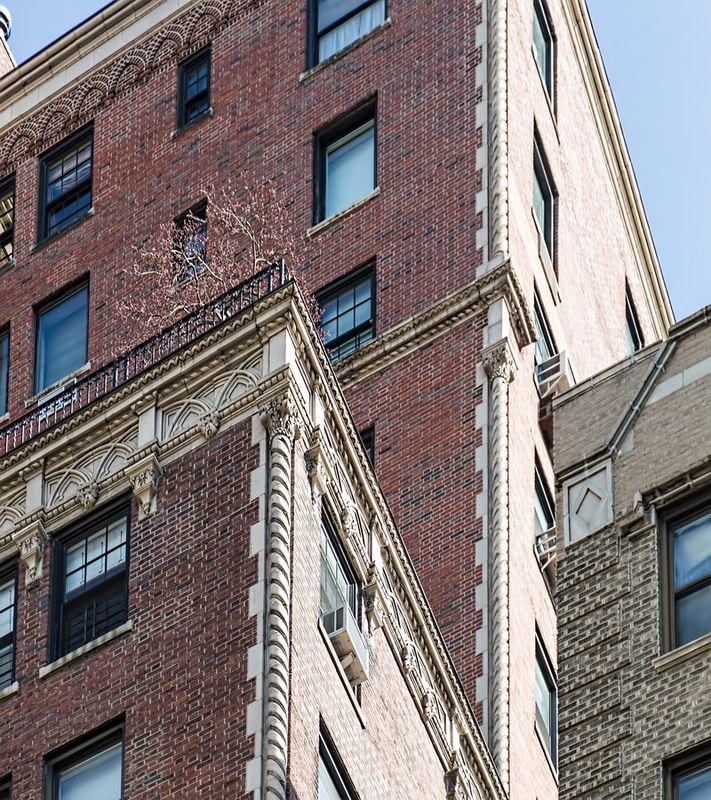 Despite appearances, not all of the rooms are double-height. 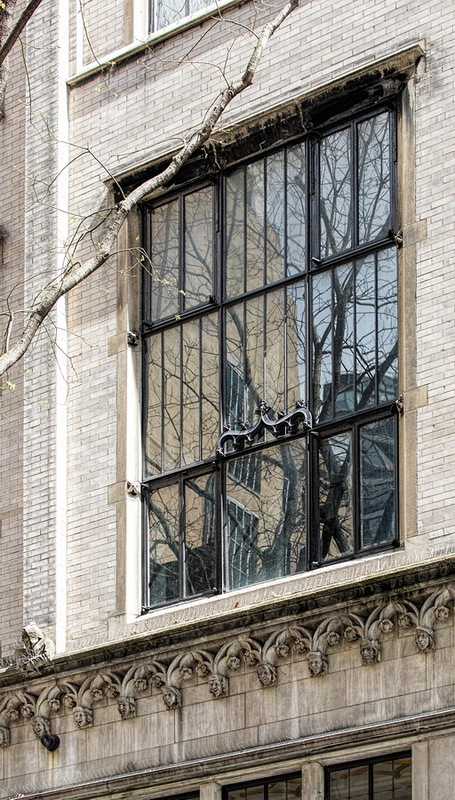 A little architectural sleight-of-hand is involved: Some of the double-height window openings are bisected by a steel panel that mimics a window pane pattern. 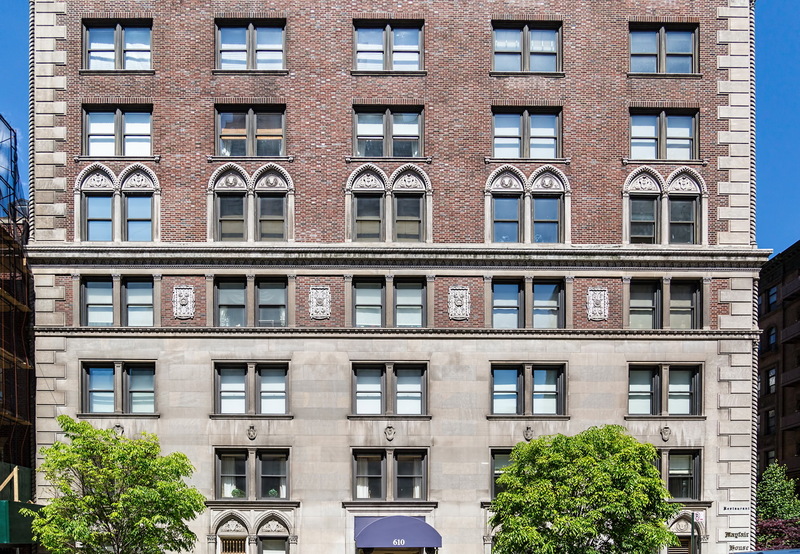 The building is a hotel in name only – built with hotel amenities to evade then-current apartment building height restrictions. 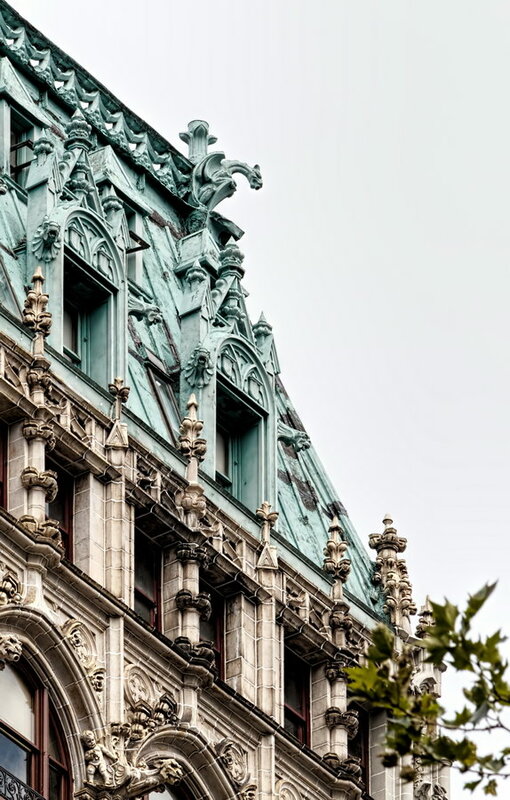 Apartments originally had no kitchens; residents took their meals in a communal dining room (now the restaurant The Leopard at des Artistes). 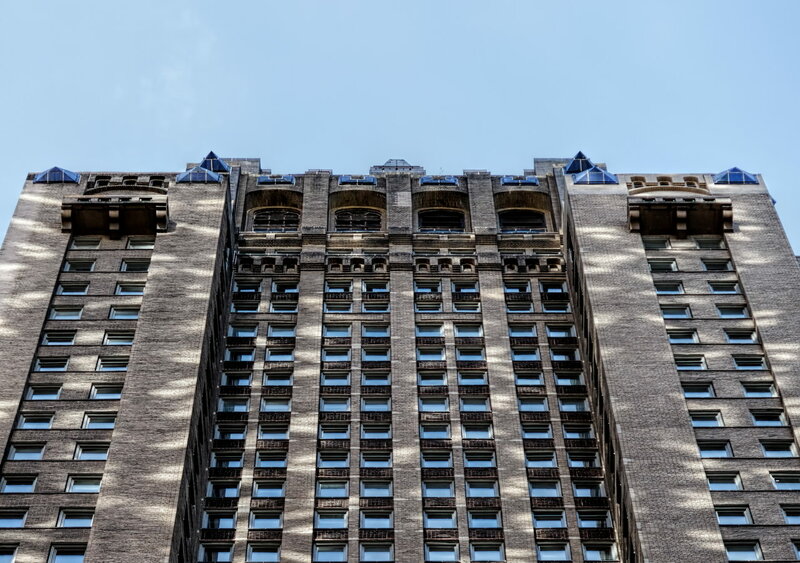 Other hotel amenities included a theater, a ballroom, and a swimming pool. 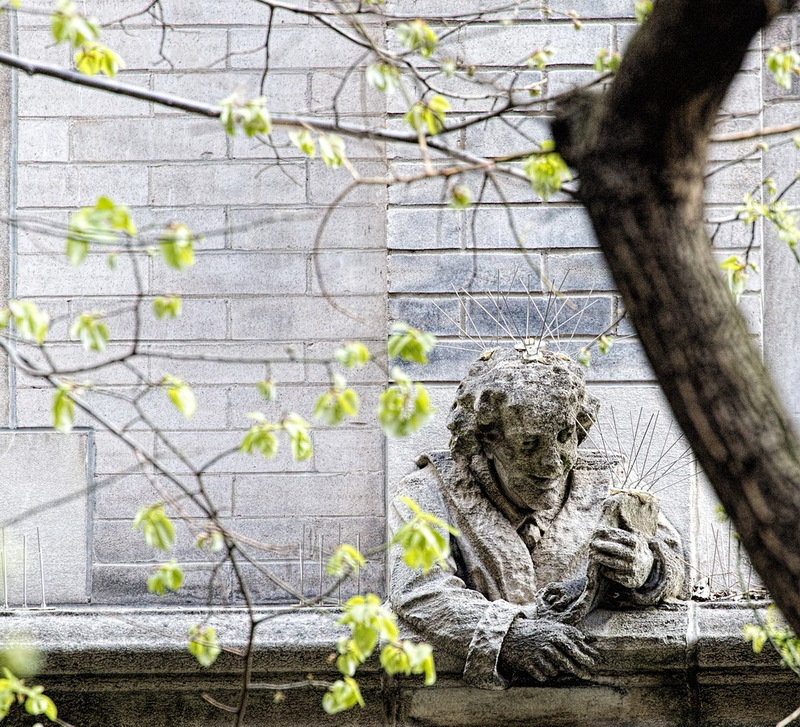 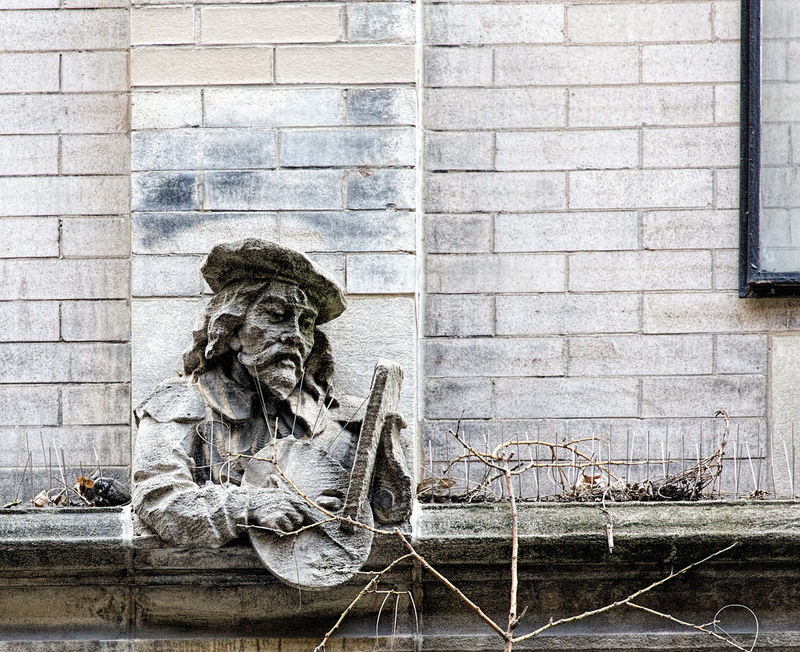 Hotel des Artistes has been home to prominent artists, performing artists – and non-artists. 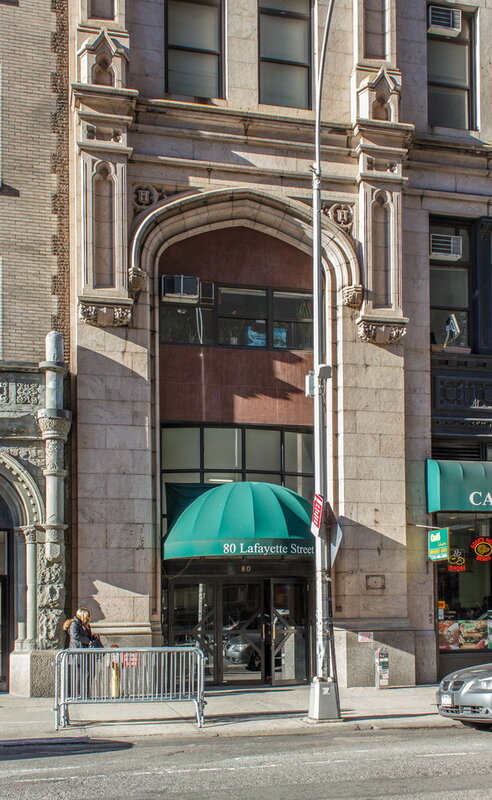 It became a co-op in 1970. 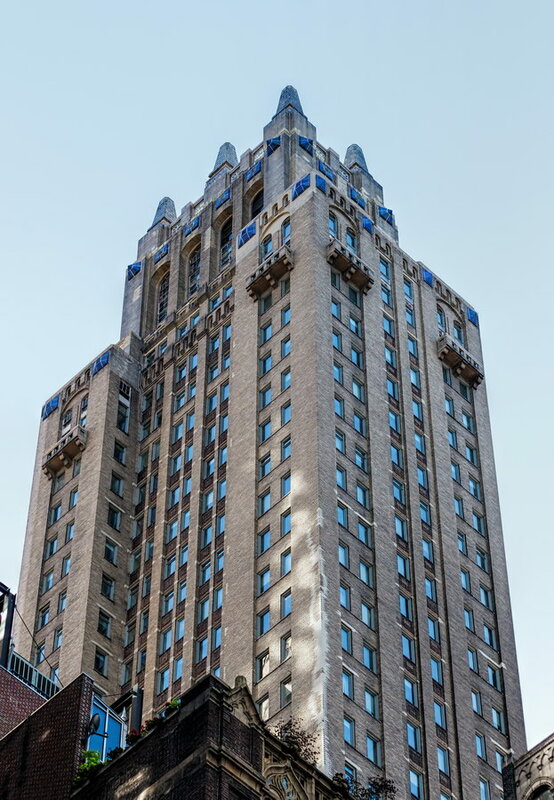 February 10, 2015 Manhattan1925, 1998, 610 Park Avenue, architecture, Costas Kondylis & Partners, James Carpenter, landmark, Lenox Hill, Manhattan, Mayfair Hotel, Mayfair House, Mayfair Regent Hotel, neo-gothic, neo-renaissance, New York City, residential, upper east side. 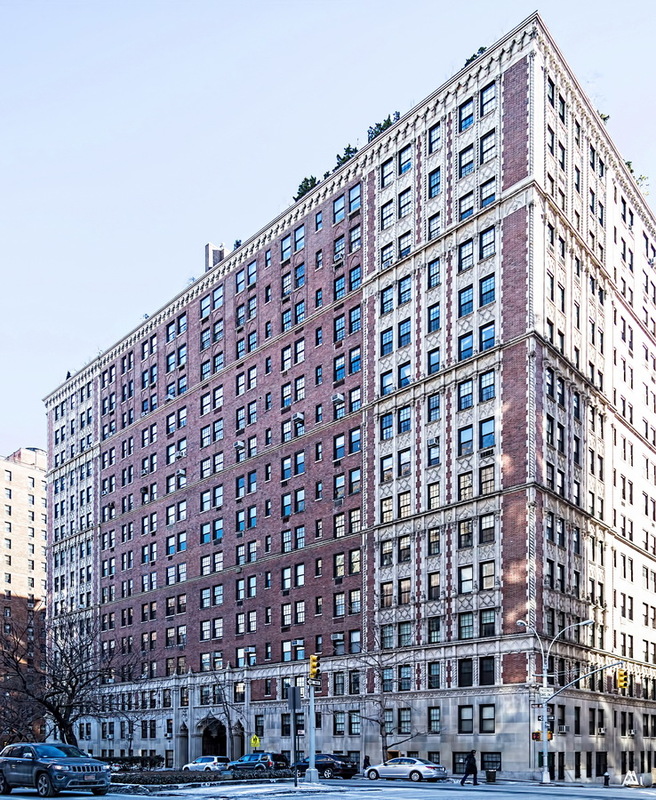 Mayfair House was designed as a residential hotel by James Carpenter, one of New York’s premier apartment house architects. 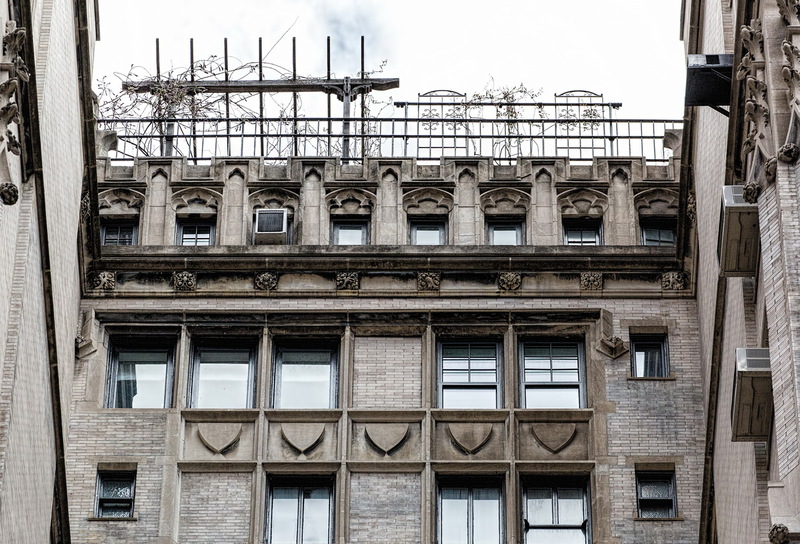 For a time, the building operated as the Mayfair Regent Hotel. 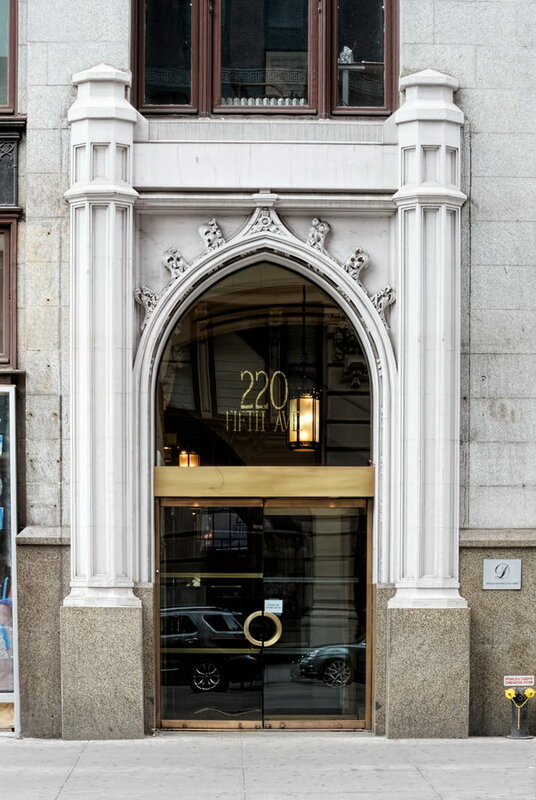 Colony Capital bought the building at a bankruptcy auction in 1998, and partnered with Trump International to convert the 210 hotel rooms and suites to 70 condominium apartments. 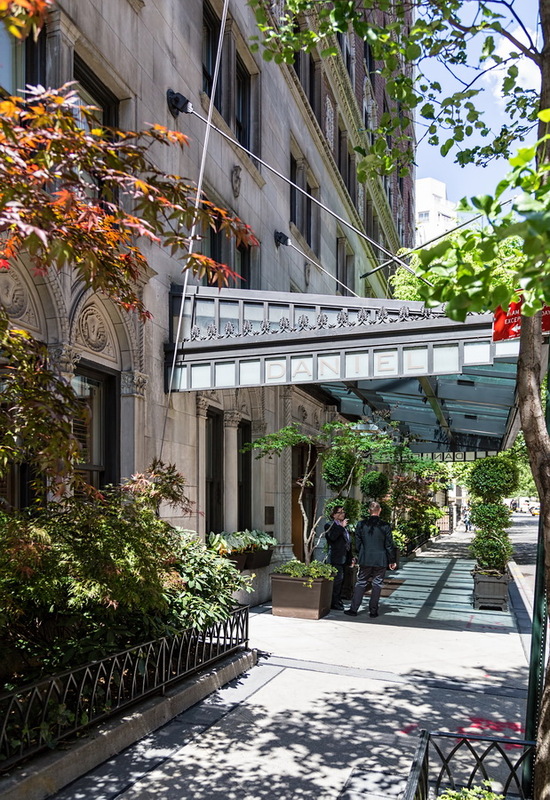 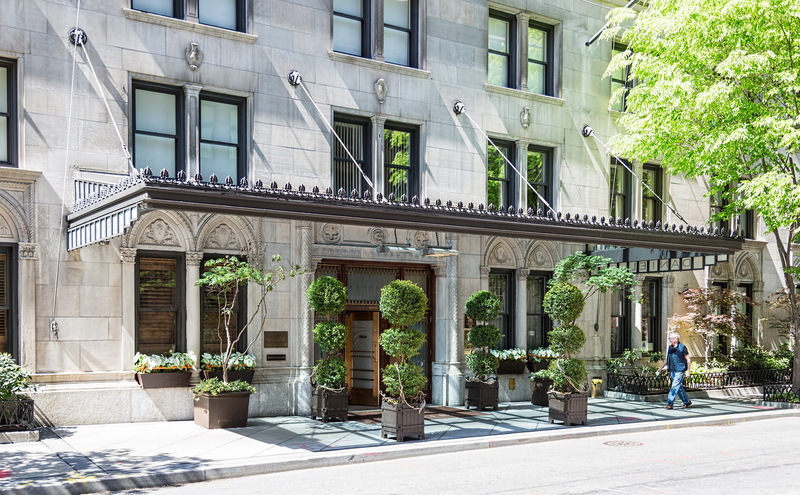 At the same time the new owners expanded the ground floor restaurant, and swapped entrances: The restaurant entrance is now on E 65th Street and the residential entrance is on Park Avenue. 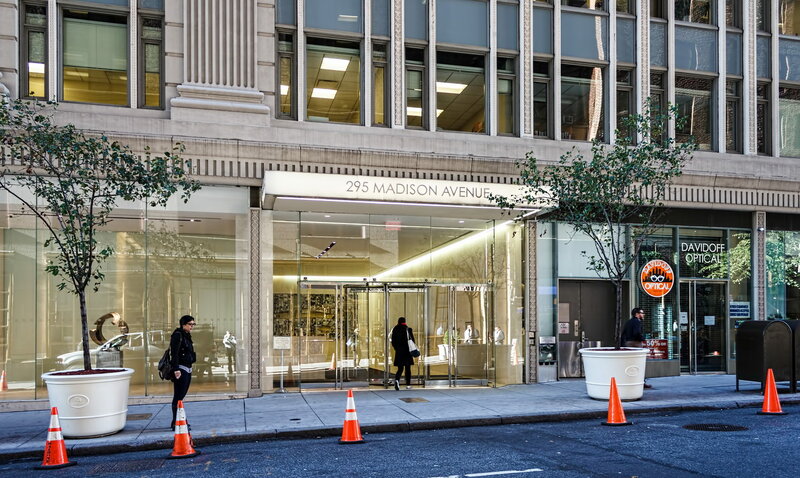 Thankfully, no glass boxes were added (as was done four blocks away, at Trump Park Avenue). 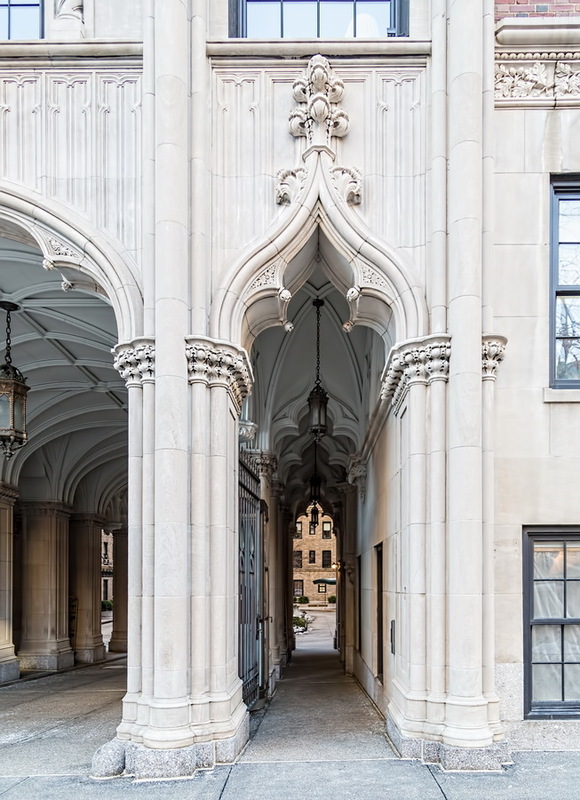 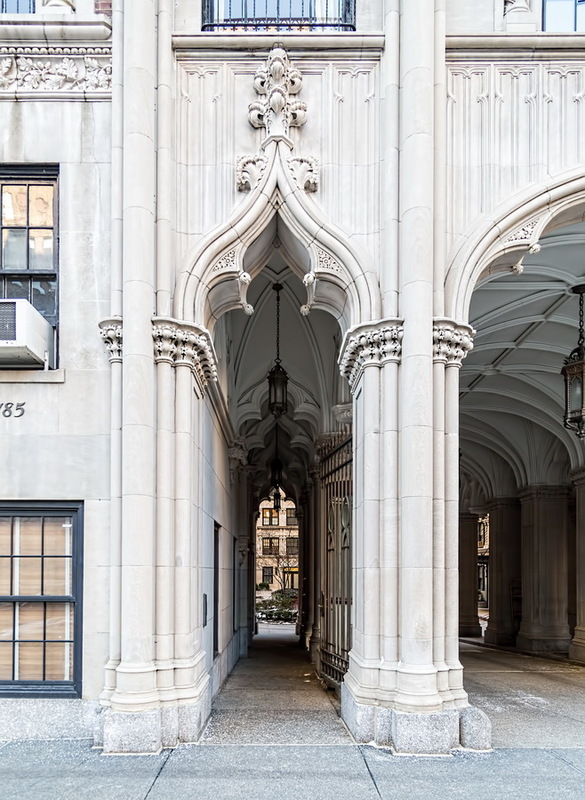 February 10, 2015 Manhattan1185 Park Avenue, 1929, architecture, Carnegie Hill, landmark, Manhattan, neo-gothic, New York City, residential, Schwartz & Gross, upper east side. 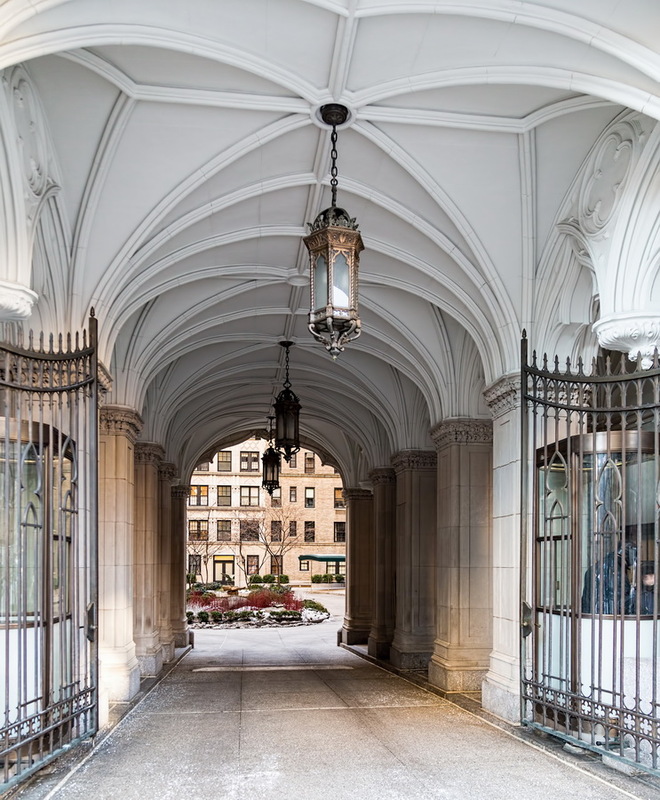 1185 Park Avenue is one of a handful of luxury New York apartment houses built around a central courtyard – and the only one of note without a name. 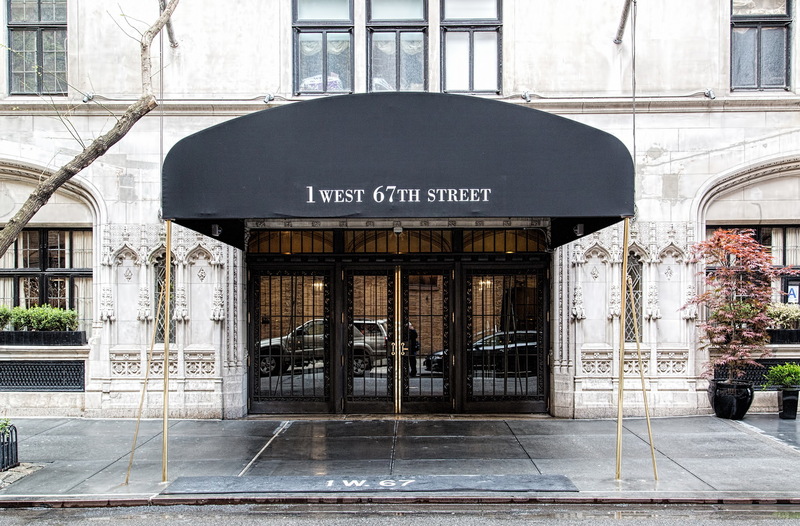 (You’ve probably heard of the others: The Dakota, Apthorp, Belnord and Graham Court.) 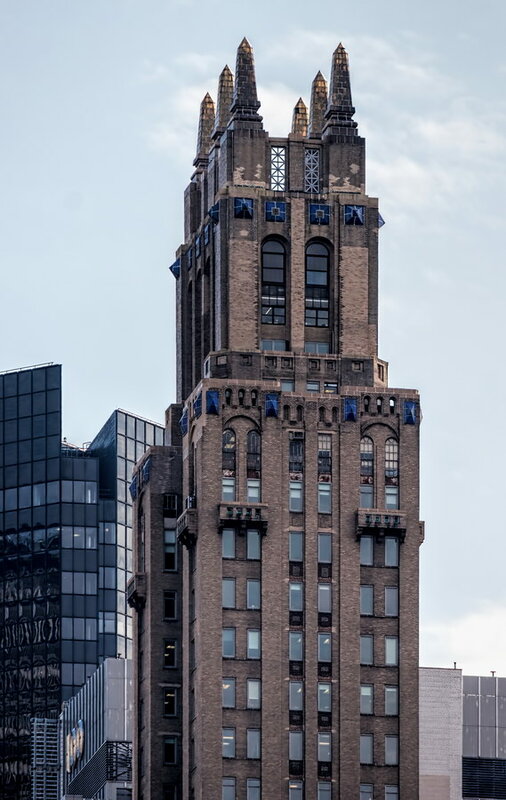 The architects, Schwartz & Gross, specialized in hotels and apartment buildings and were known for exceptional apartment layout. 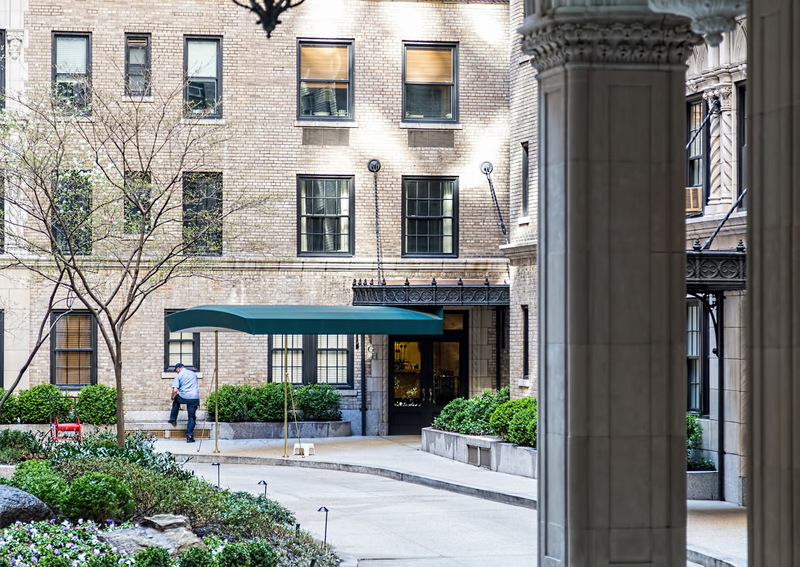 There are 12 apartments to a floor (though some have been combined) arrayed around the courtyard. 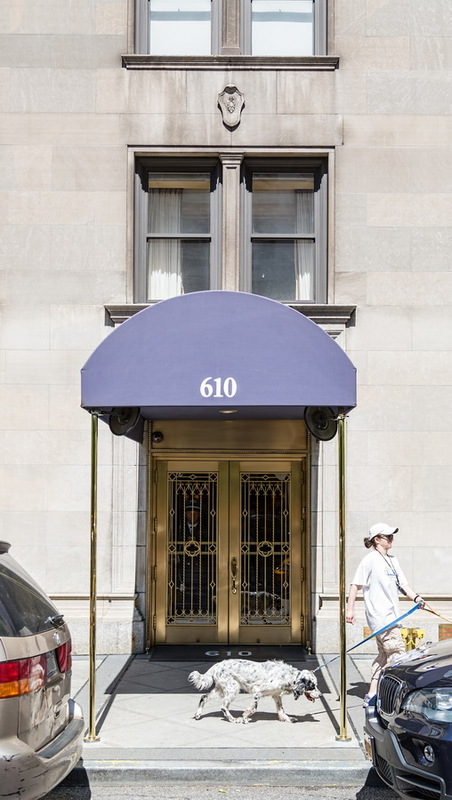 Six separate lobbies serve those apartments, so that each elevator landing has only two apartments. 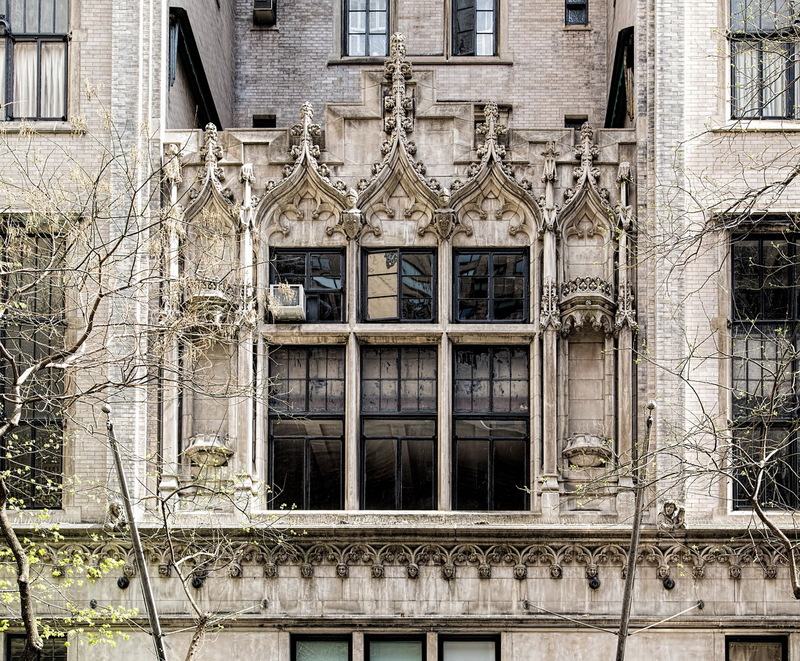 The NY Curbed archive takes a peek at some of 1185 Park’s multi-million-dollar homes. 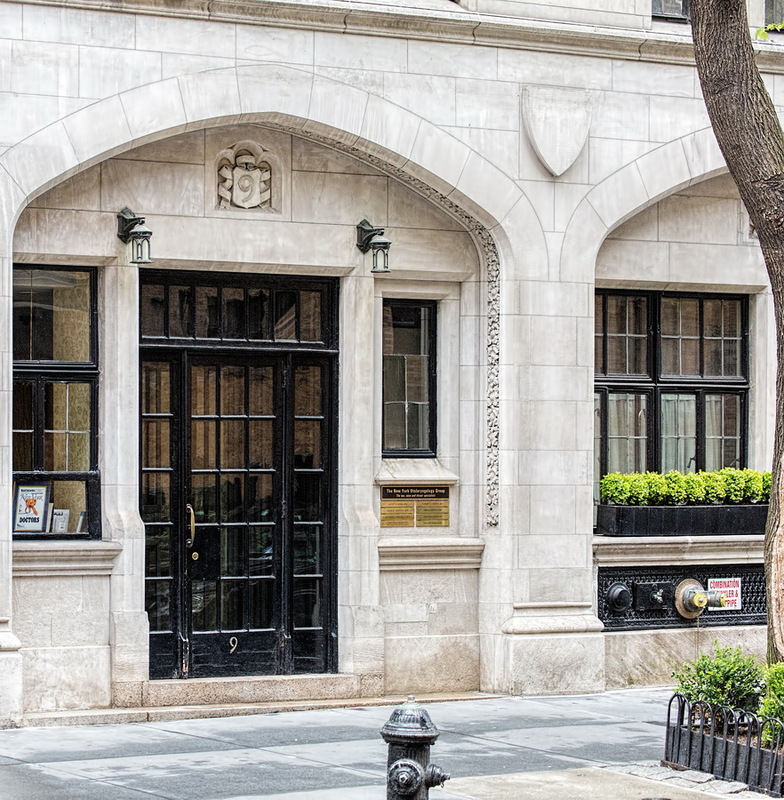 If you Google “1185 Park Avenue,” many of the results will refer to the book of that name, a memoir of Annie Roiphe. 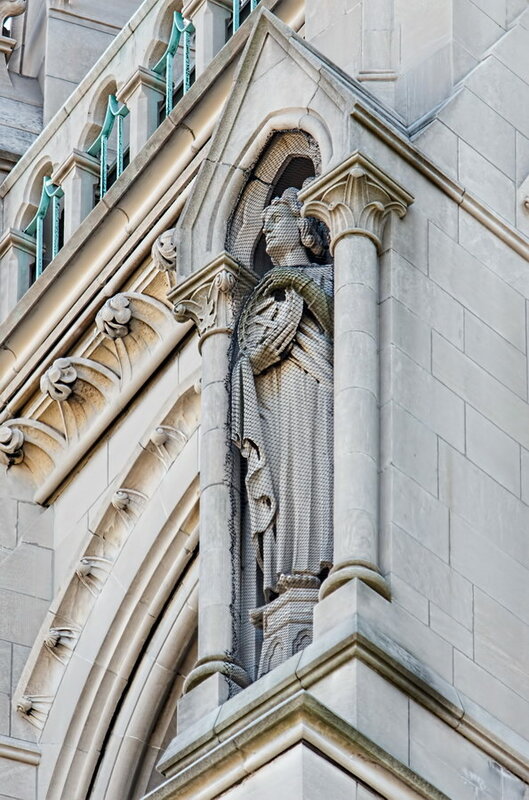 That’s getting off the subject of architecture, but her tale is a reminder that money and plush surroundings aren’t everything. 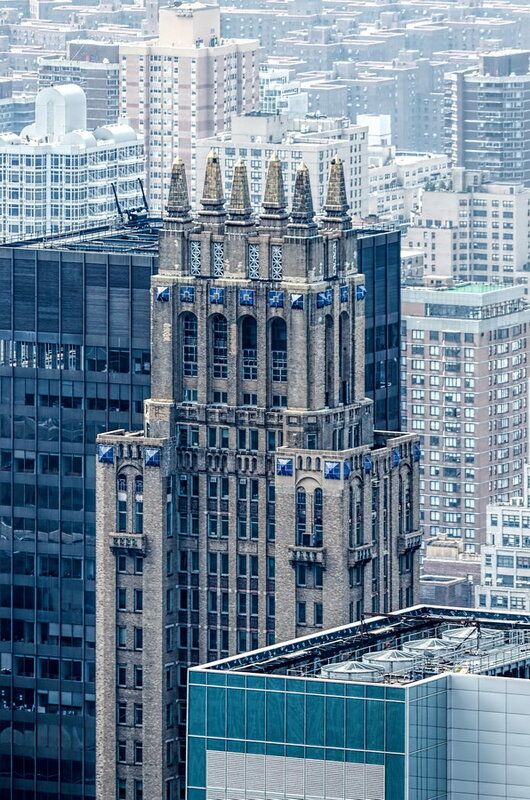 So don’t feel bad that you don’t live here.